Stoke Park is Europe’s leading 5 AA star hotel, spa and golf course and I found myself there a few times for different occasions. 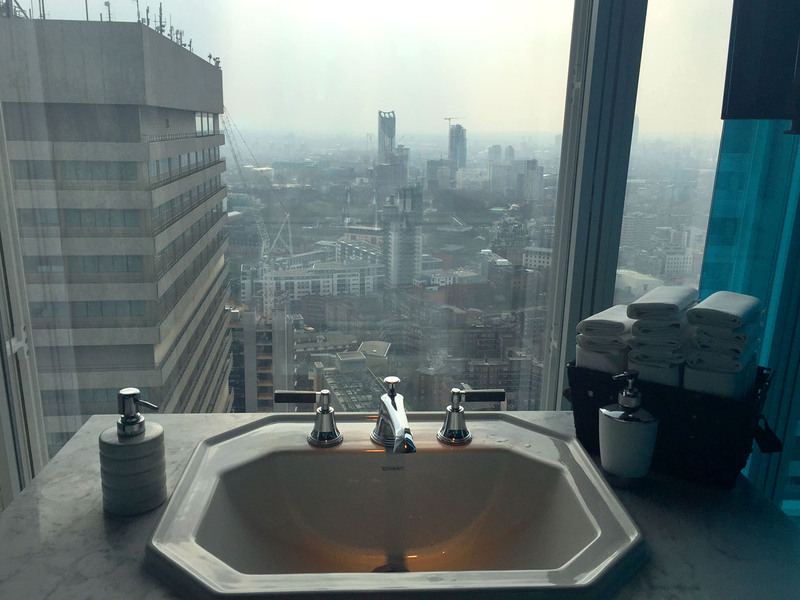 What I have always loved about UK’s hospitality standard is that when they say 5 star, they mean 5 star. 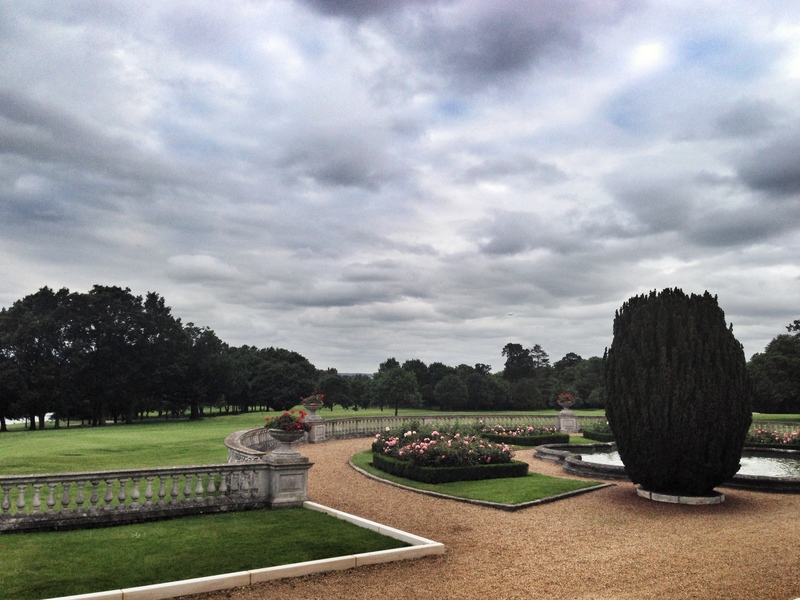 Stoke Park’s service is impeccable, you feel at home and it’s one place where i have truly been able to forget about the world I have left behind in London. 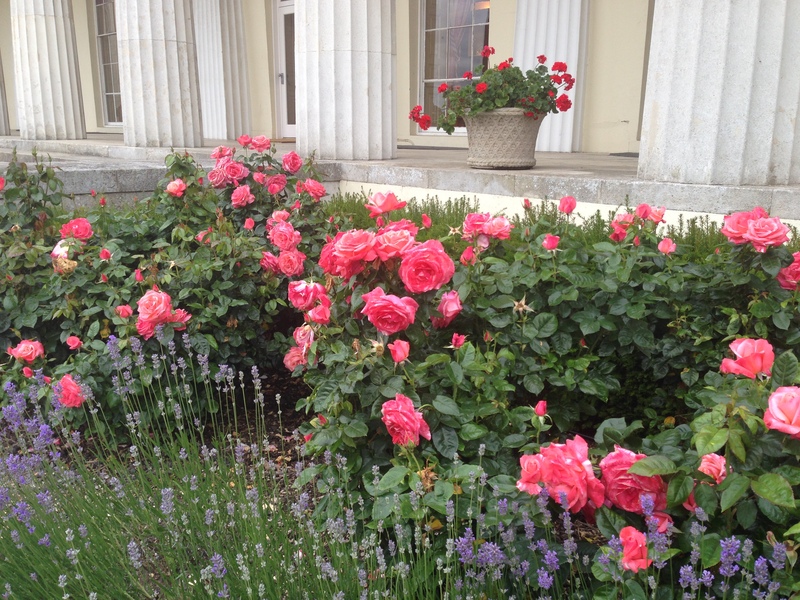 Stoke Park is an oasis of parkland, lakes and gardens, located just an hour away from London. I couldn’t get enough of the beautiful landscape! I was lucky to see it both in full bloom of summer and in stunning autumn palette. My most memorable time here was for Father’s Day 2014. My father is a brilliant golfer who is travelling all corners of the world with the game. 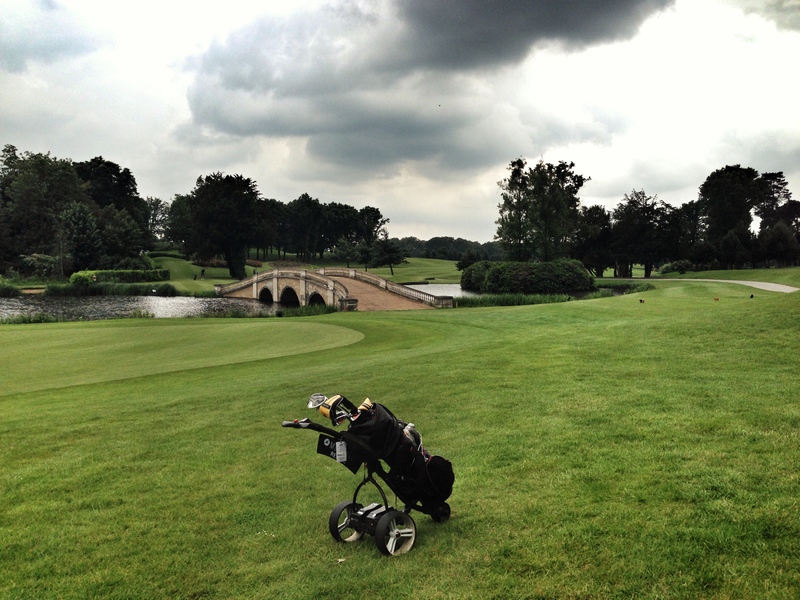 Stoke Park was on his list of courses to play, so when I heard he was visiting London, I knew exactly the place where we could go for a treat. 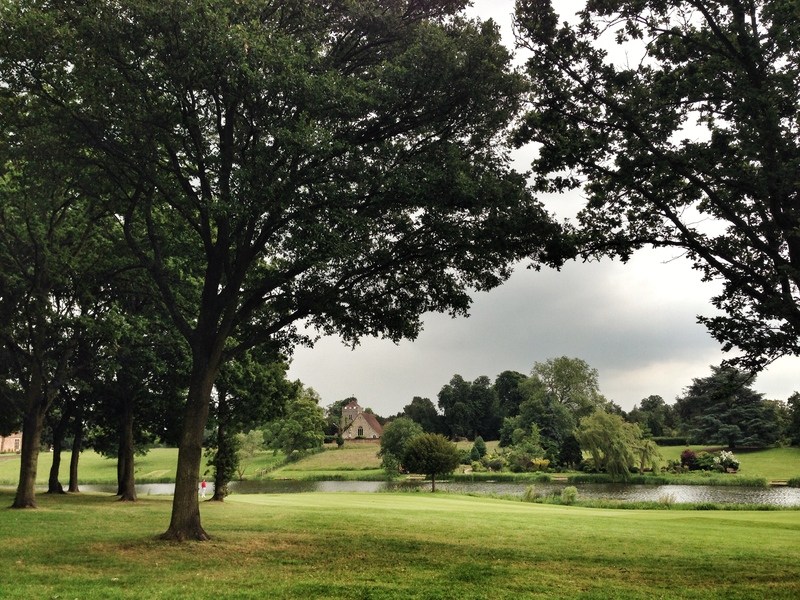 Golf break included one night stay at the hotel, a game of golf, breakfast, lunch and dinner. 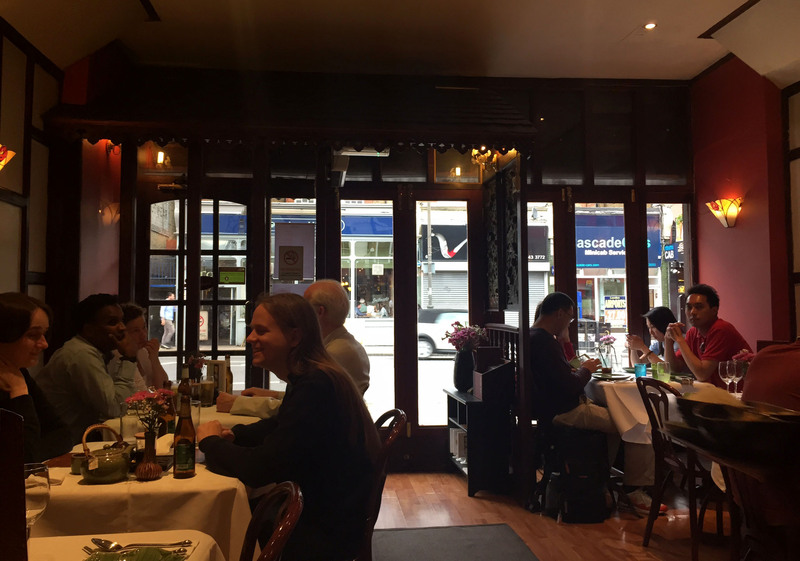 Between steam room and swimming pool we took a quick lunch at San Marco, Italian brasserie with tables situated on a leafy terrace. 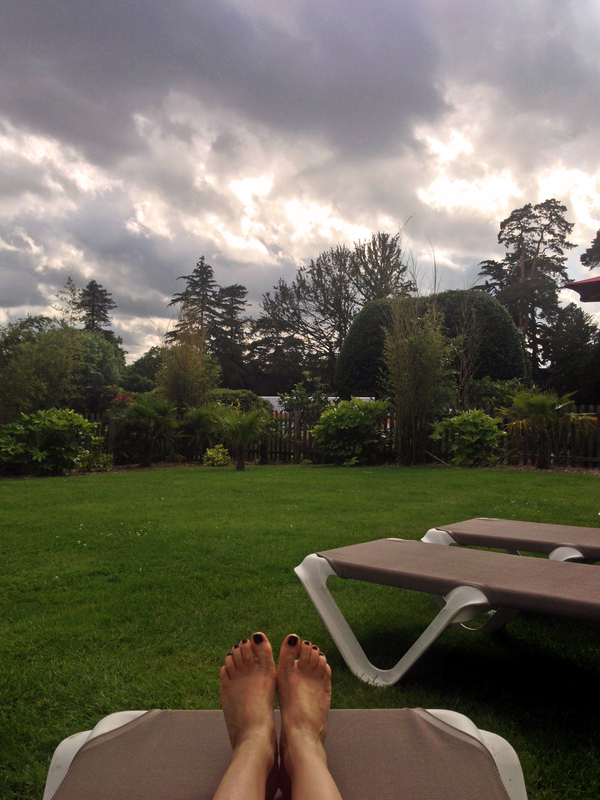 Weather was perfect – sunny with a soft breeze. I ordered a crisp tuna salad. 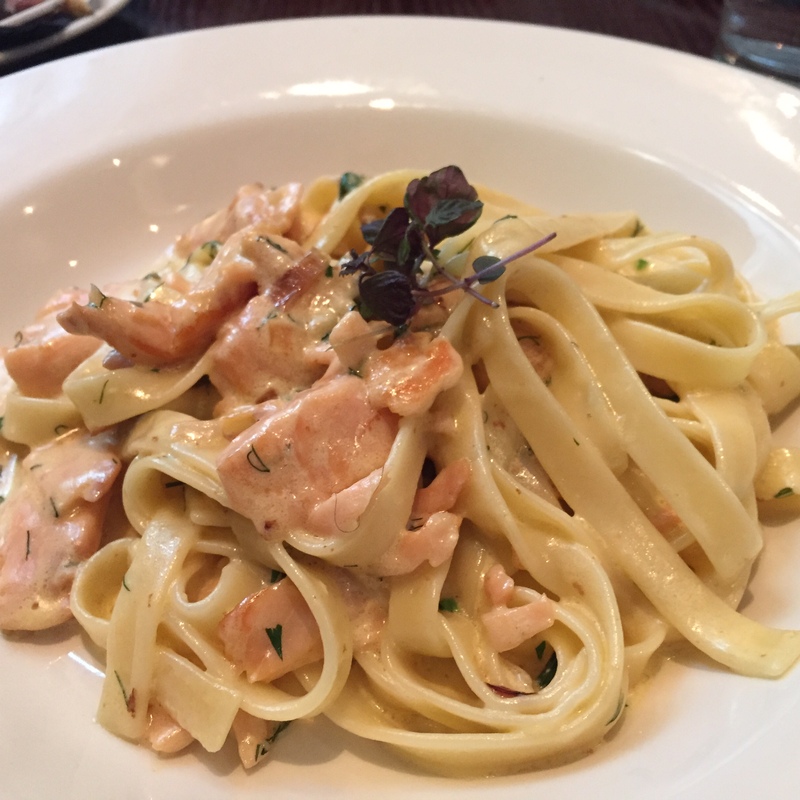 Portion was very generous, but uber fresh and so delicious, I wiped my place clean, despite wanting a very small lunch. Atmosphere at San Marco is lovely, I love that guests were encouraged to have lunch and drinks in their spa robes. 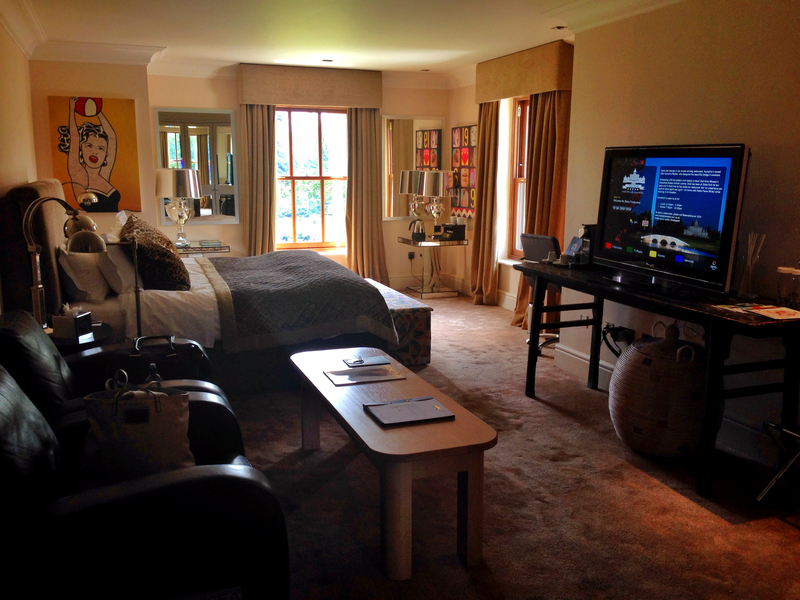 I loved the decor of the rooms, unlike the rest of the resort, this room was an eclectic take on classic British. 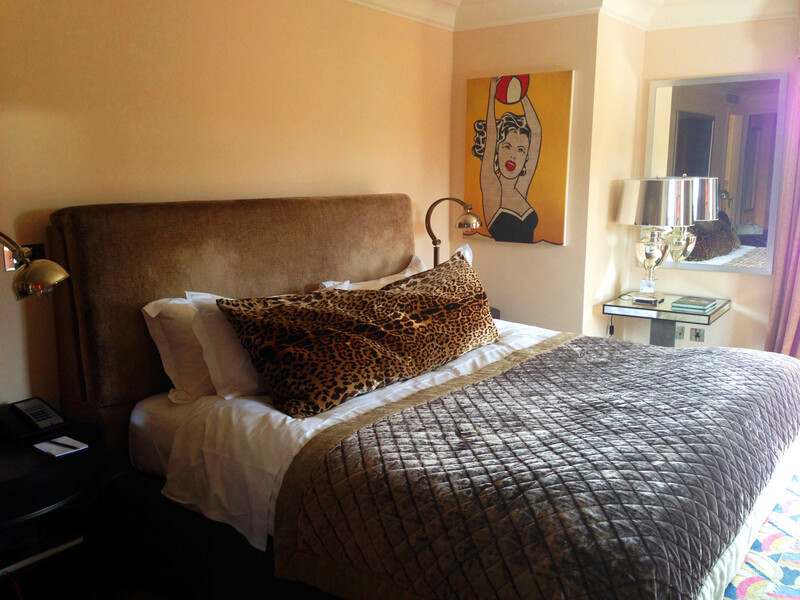 Who can resist a little leopard print?! As my father left for a game of golf, the rest of my day was filled with more steam room, swimming and sunbathing sessions. 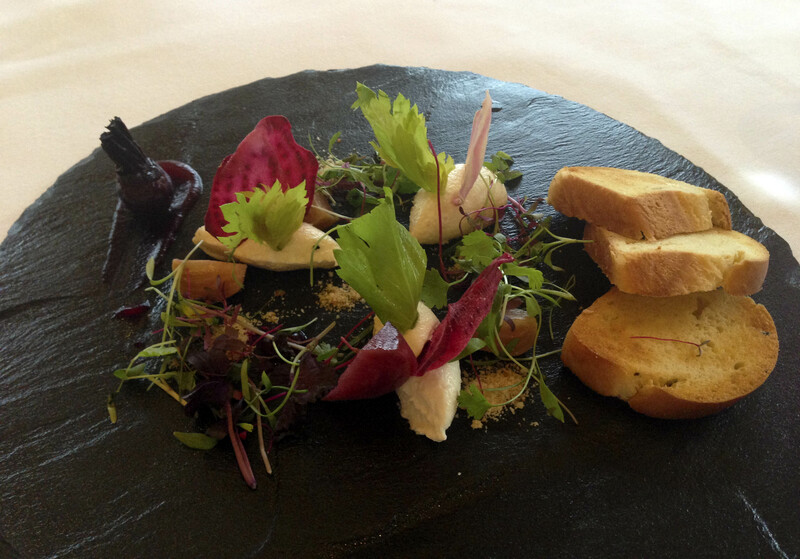 For dinner we booked a table at Stoke Park’s 3 AA Rosettes Humphry’s restaurant. 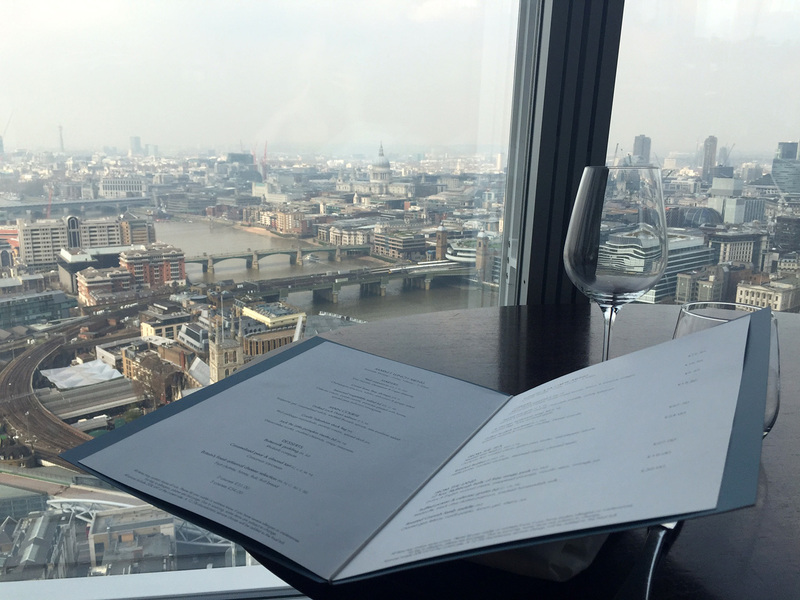 It was the perfect setting for a special occasion. 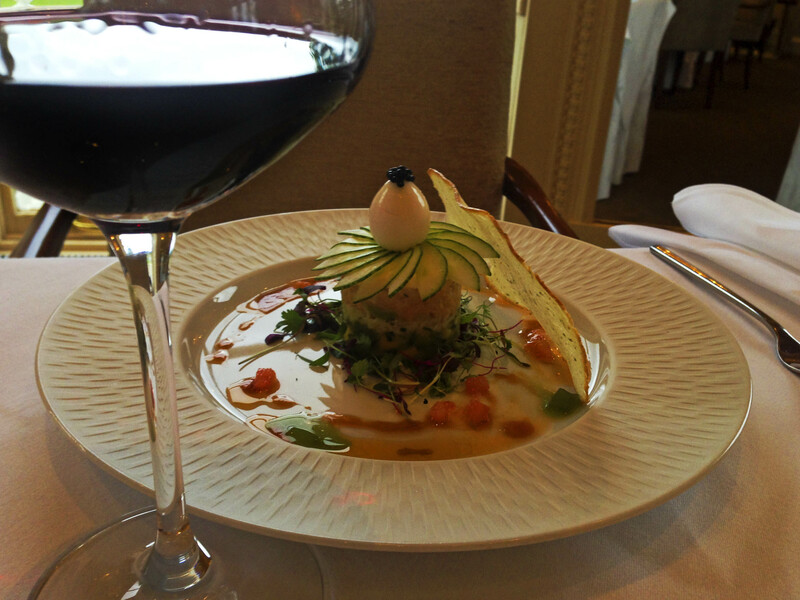 Restaurant offers panoramic views of the estate and the lake. 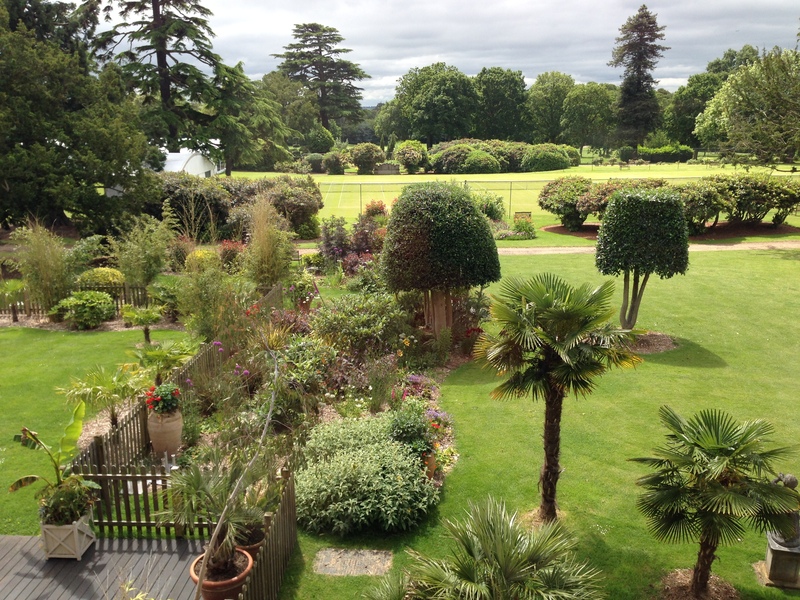 l can only imagine how stunning weddings here must be! We opted for ‘a little bit of everything’ kind of dinner. Bitter Chocolate Box filled with Caramel and Chocolate Mousse, Spiced Cointreau Gel, Clementine Sorbet, Hazelnut Tuile and Caramel Sauce. This meal was fabulous from start to finish. 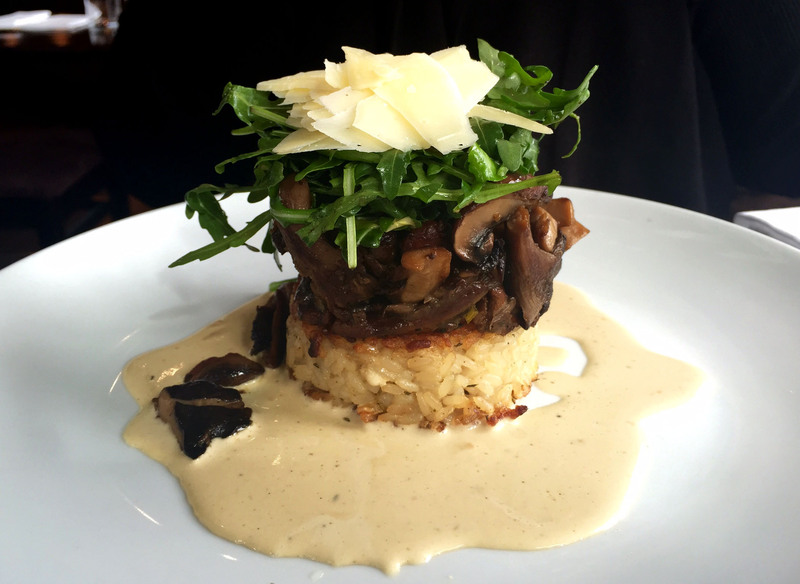 Each course flowed perfectly into the next and flavors were both delicate and surprising. 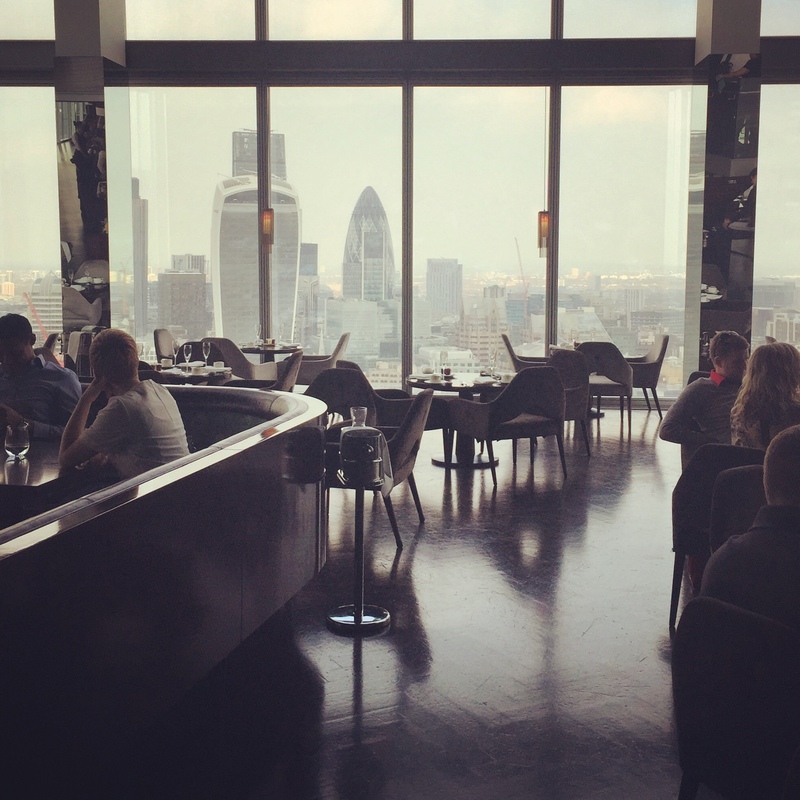 Service was impeccable and we have thoroughly enjoyed our evening. 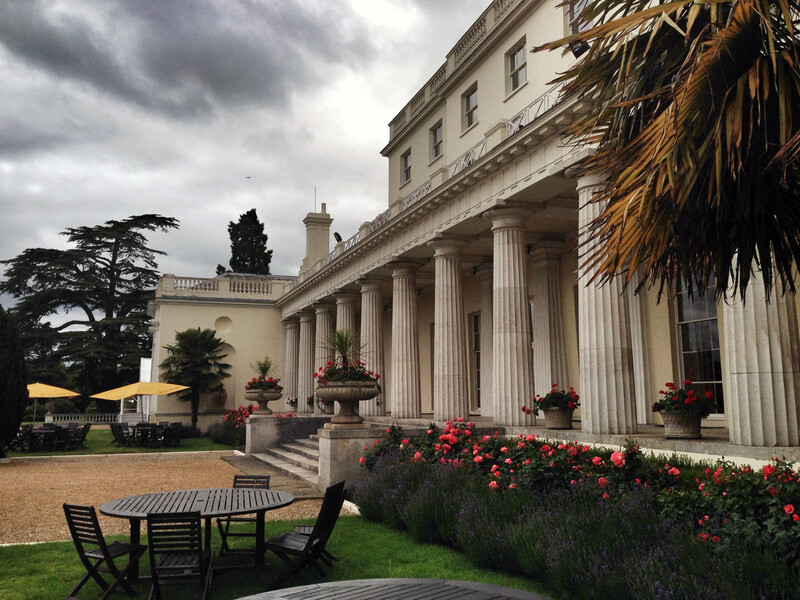 I would highly recommend visiting Humphry’s if you find yourself in Stoke Park. I loved Stoke Park so much I got massive blues on my taxi ride home. Little did I know it would only be less than 4 months and I’d be back! Yes! As we dismounted from horses (Uber cab), we were greeted like princesses by the staff of Claridges, exactly how we love to be treated after a Sunday morning heavy gym sessions. 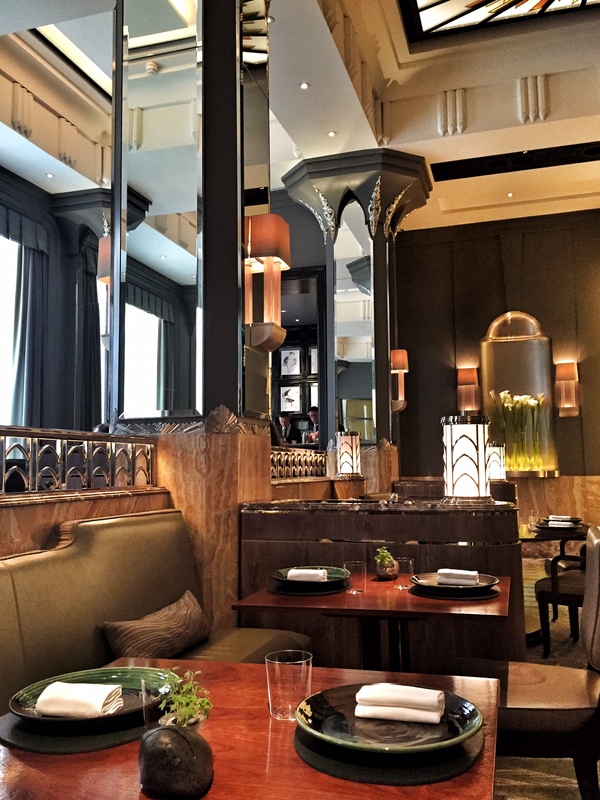 The interior of Claridges is a timeless example of Art Deco excellence. As you walk through the twirling door you are transported into the glamour of the 1920s and you can almost hear the echoes of jazz coming from the ballroom. 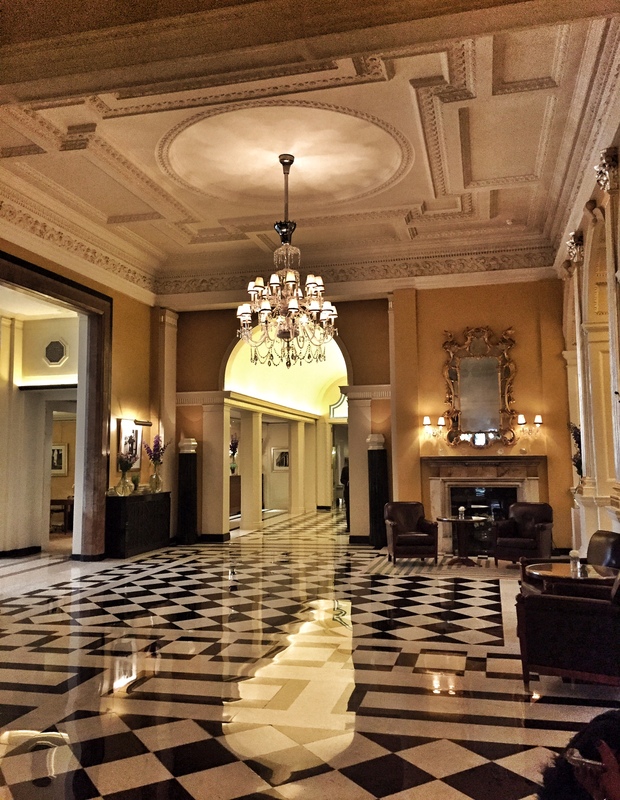 For design freaks like us we really appreciated this architectural heaven in Mayfair. 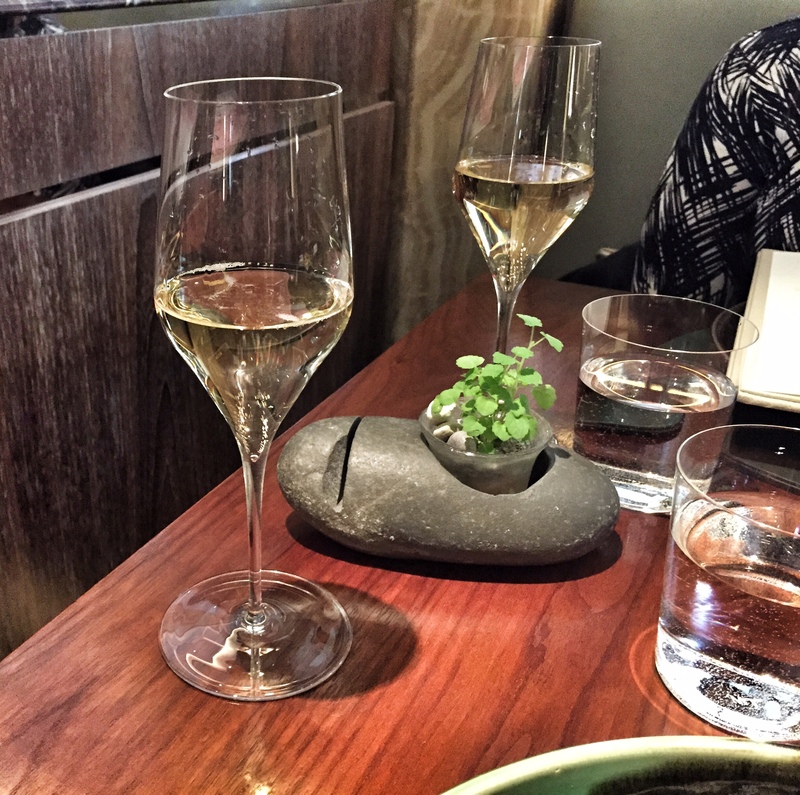 We came for a Sunday luncheon to Fera, one of Claridges restaurants. We thought we deserved a treat as I was feeling a tad down about work over the last couple of weeks and this was definitely mood lifting. 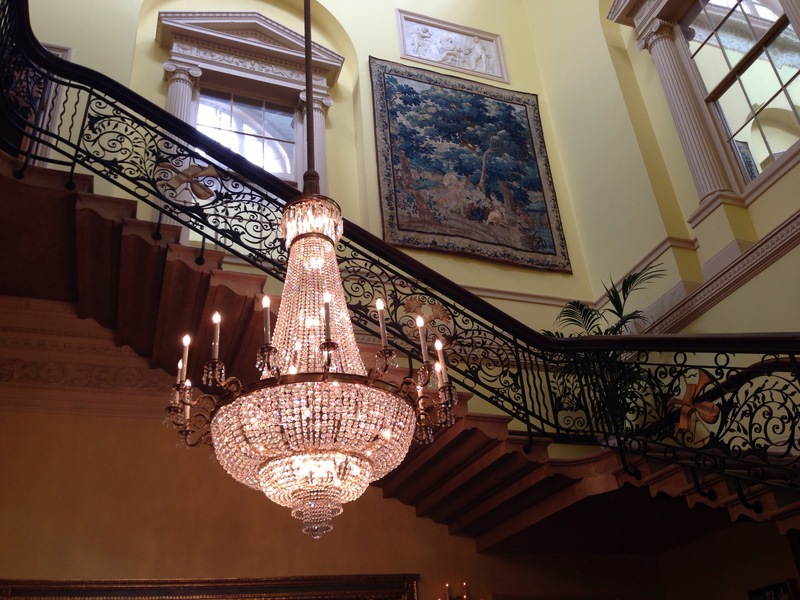 Upon arrival we felt the five star luxury service with the warm genuine greeting by all. 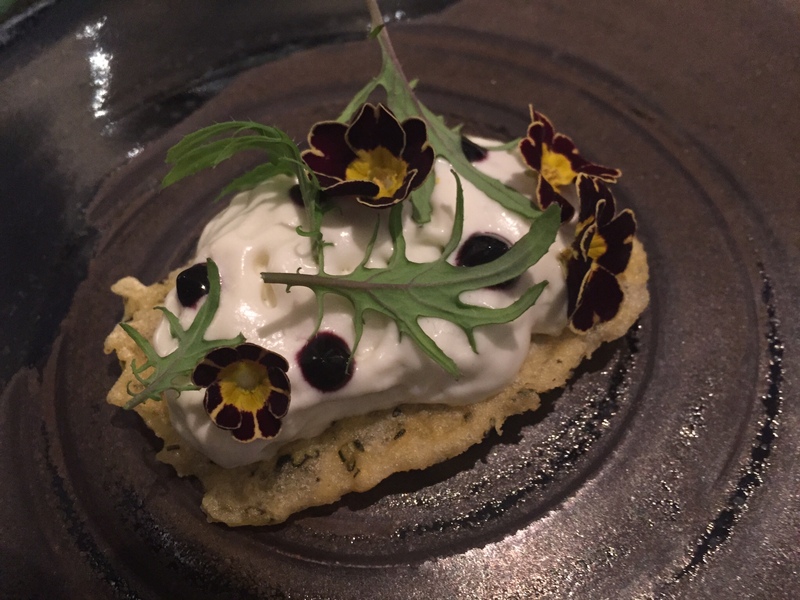 As we looked through the stunning menu we were served wafers with cheese foam and flowers. 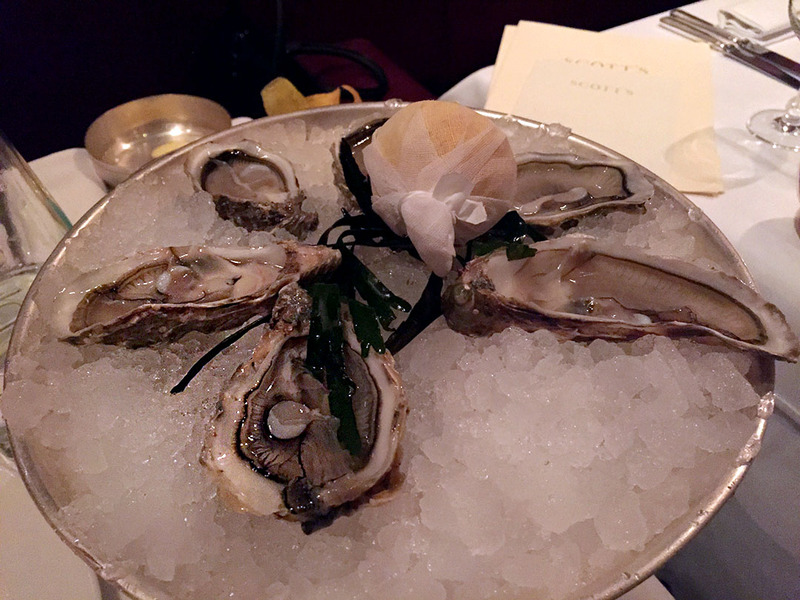 It was crisp and creamy and there were different flavours popping out with every tongue lash. 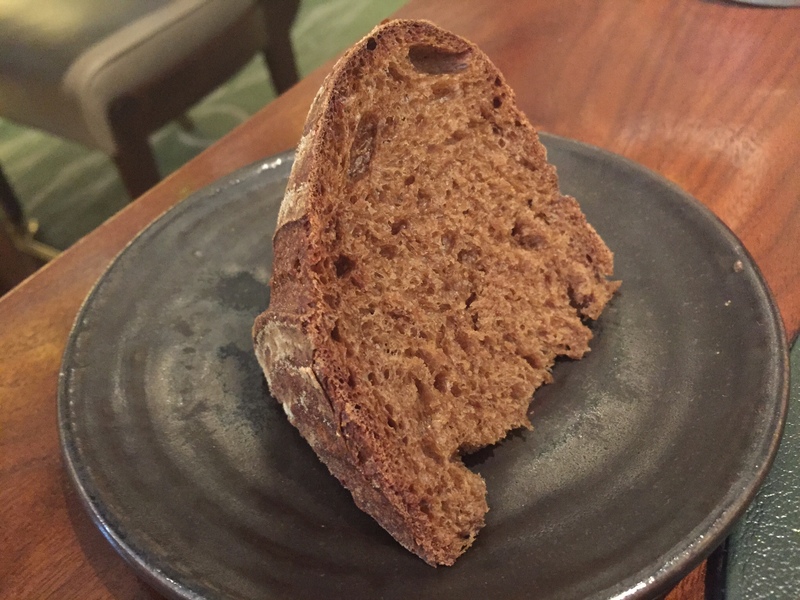 Once we had ordered we were served a warm wedge of rye bread which was freshly baked, it was served with hand churned butter. It was all so moorish I could have eaten a couple of more wedges. 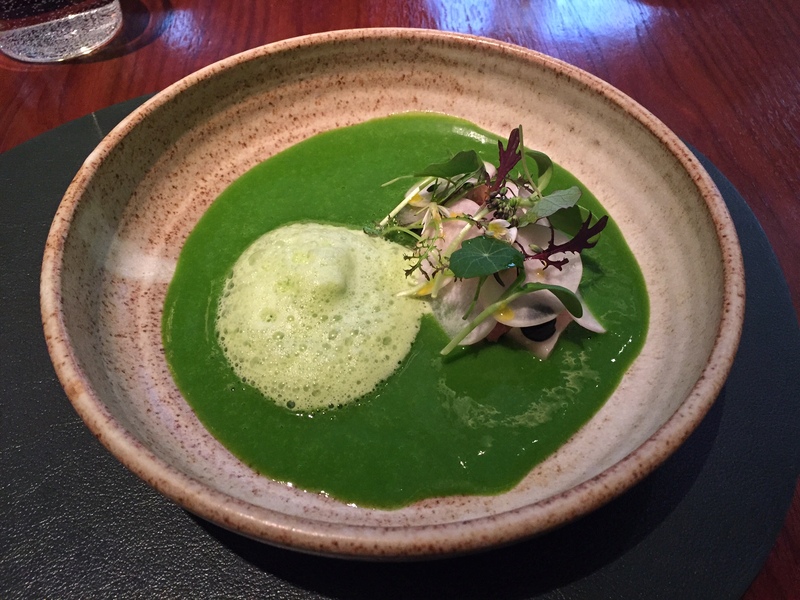 For starters Elena had the Spring Velouté with Smoked Pork, turnips, ramsons and herbs. 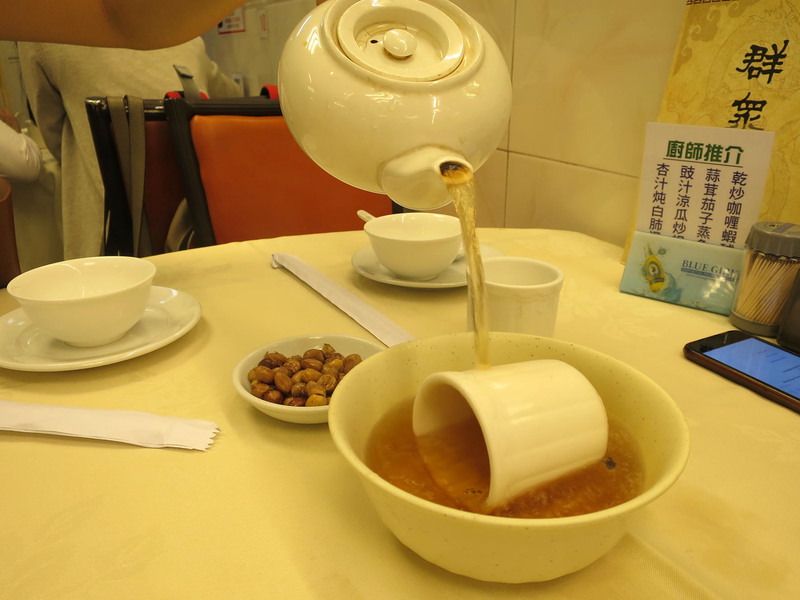 The Spring Velouté was theatrically poured around the dish in front of us. 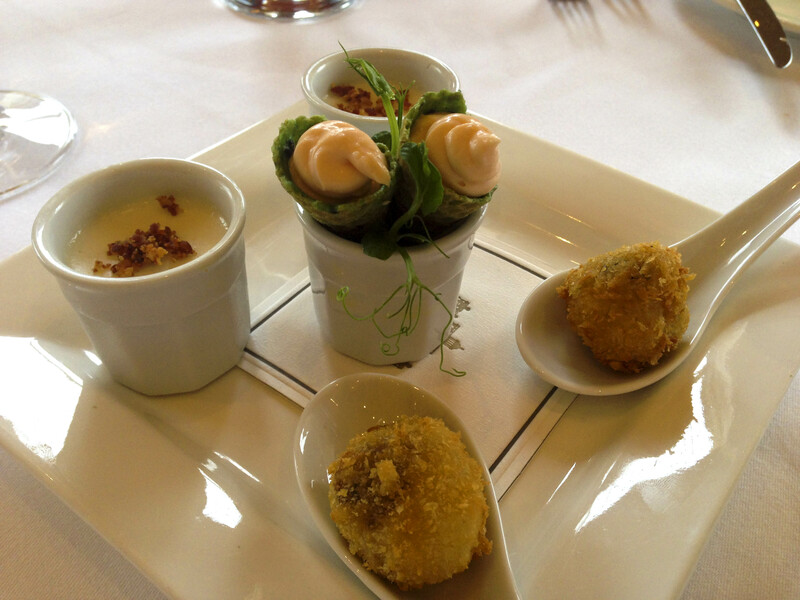 Every element of the dish brung its own flavour. The ramson, something we had never tasted (we think) brought a warm garlic flavour and the idea that we should really be using this ingredient in our own cooking. 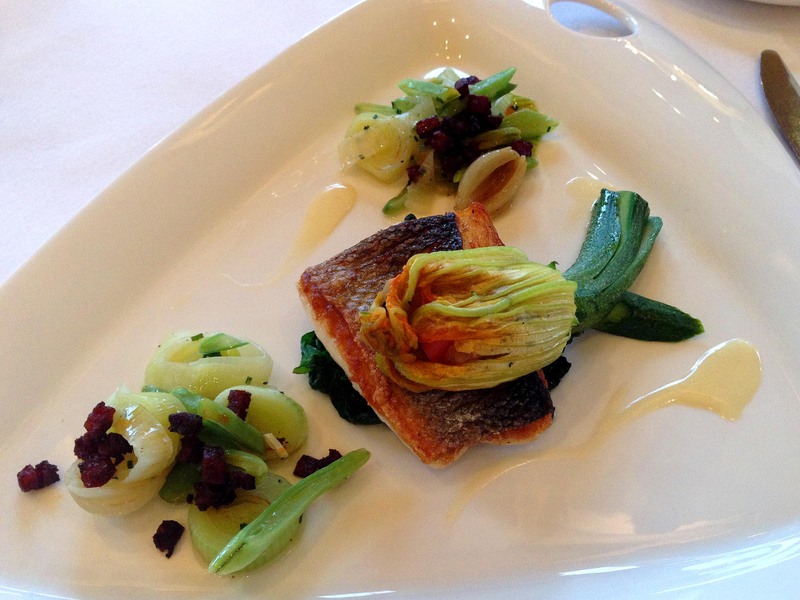 I had the Smoked Mackerel, Pickles Mushrooms, Dandelions and Apple Marigold. 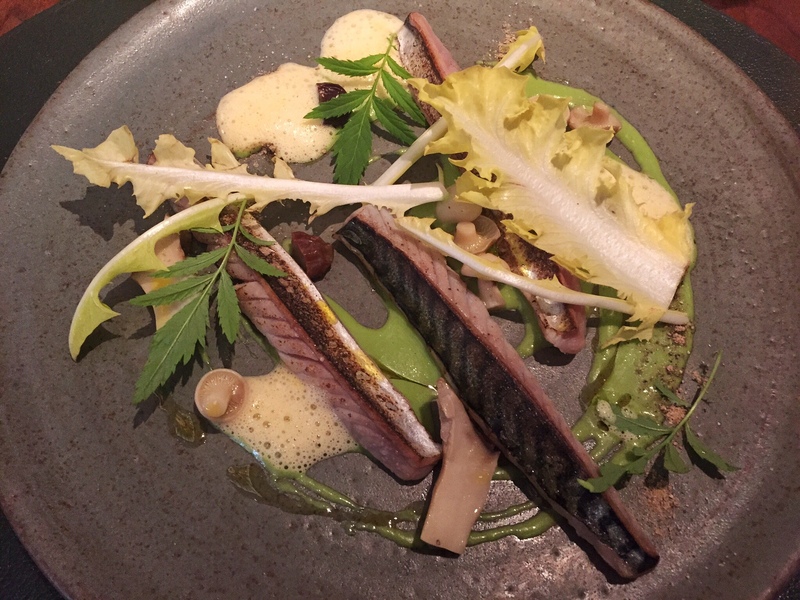 The mackerel wasn’t overly smoked but had a subtle undertone with every bite. The mushroom pickles were tiny and brought little pops of that vinegary flavour to the dish. 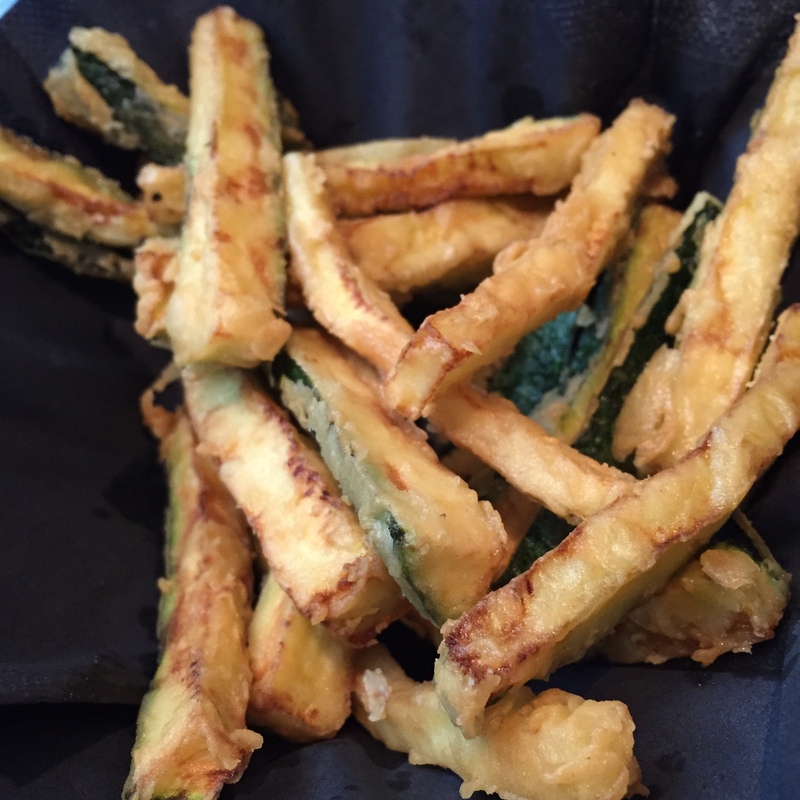 The dandelion leaves brought a fresh and spicy twist to the dish. This truly was a feast for the taste buds. 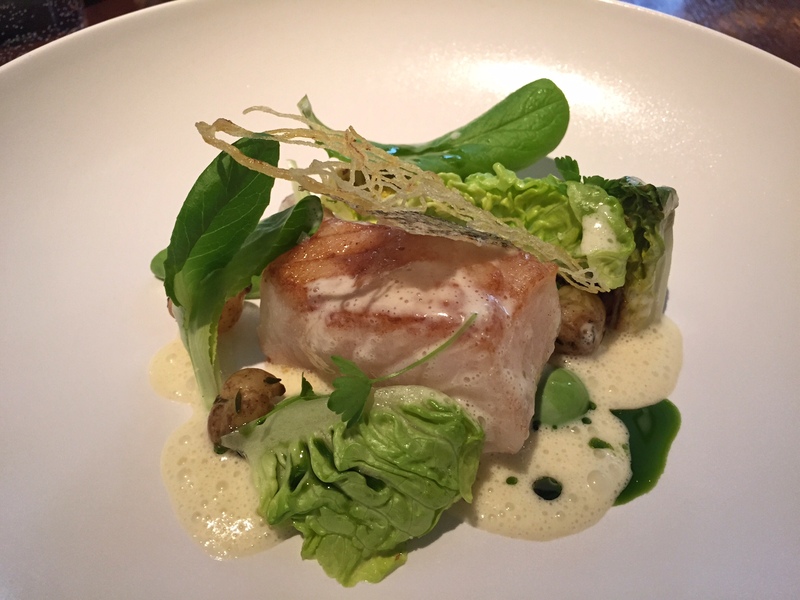 For mains Elena had the Cornish Cod, gem lettuce hearts and leaves, parley and jersey pearls. 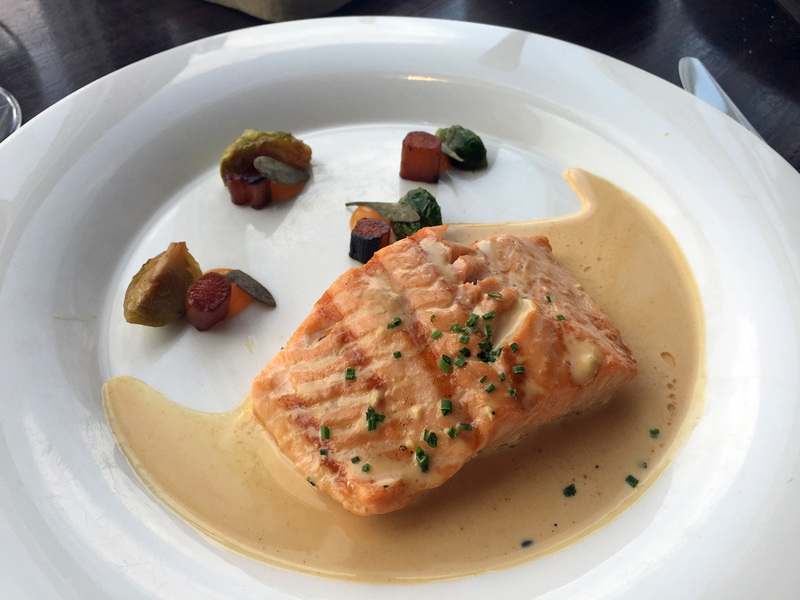 The cod just flaked away so easily and melted in the mouth. 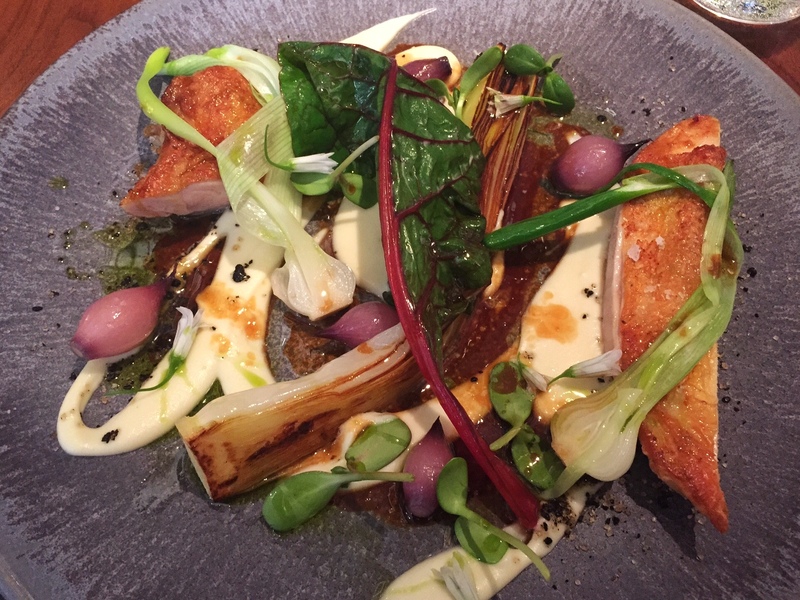 I had Reg’s corn fed chicken with BBQ leek, onions and celeriac cream. The chicken has a lushious crispy skin. The chicken tasted sweet throughout with was a lovely flavour indeed. The celeriac cream was smooth and rich and I could have eaten a whole bowel full. 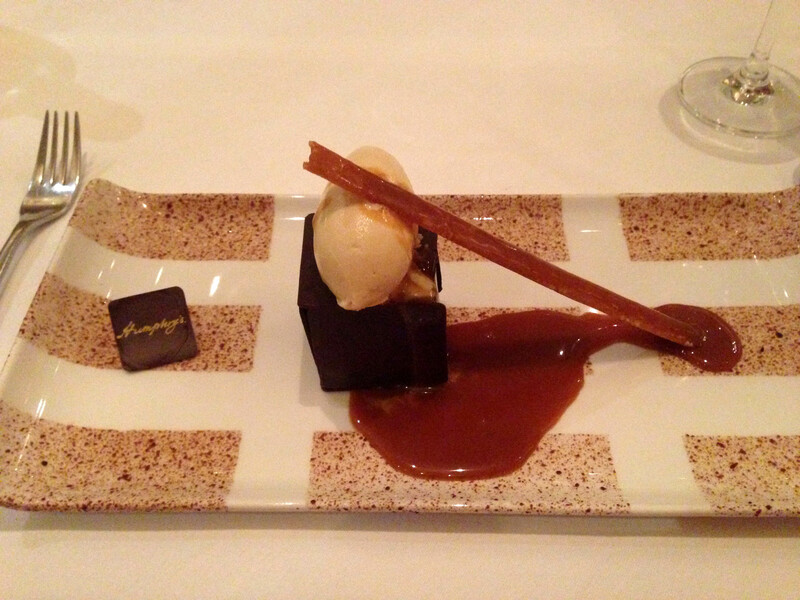 Desserts were again so well thought out with each taste and texture on the dish. 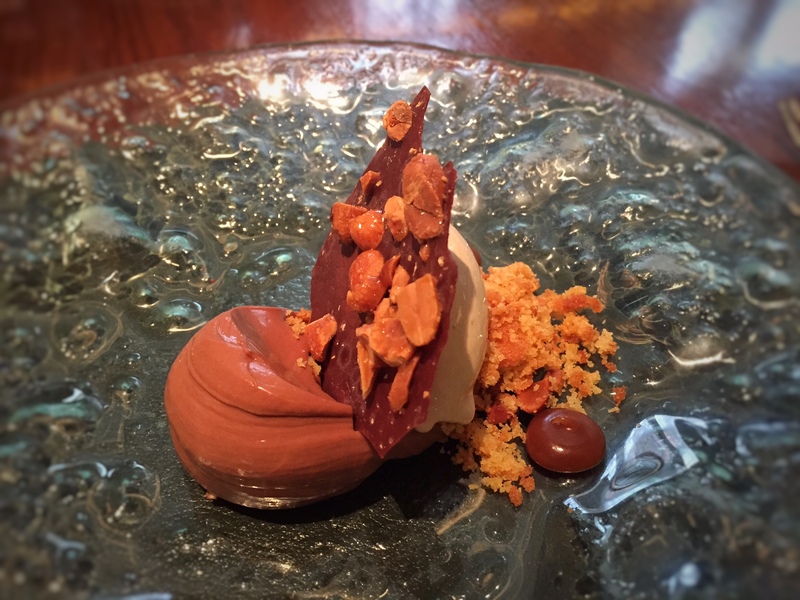 Elena naturally went for the chocolate option and had a stunning Smoked chocolate cream with pecan ice cream and verjus caramel. As your tongue wraps around the chocolate you get that initial chocolate taste we are all used to but then you get the smokey after taste which was lovely but took a few scoops getting used to. 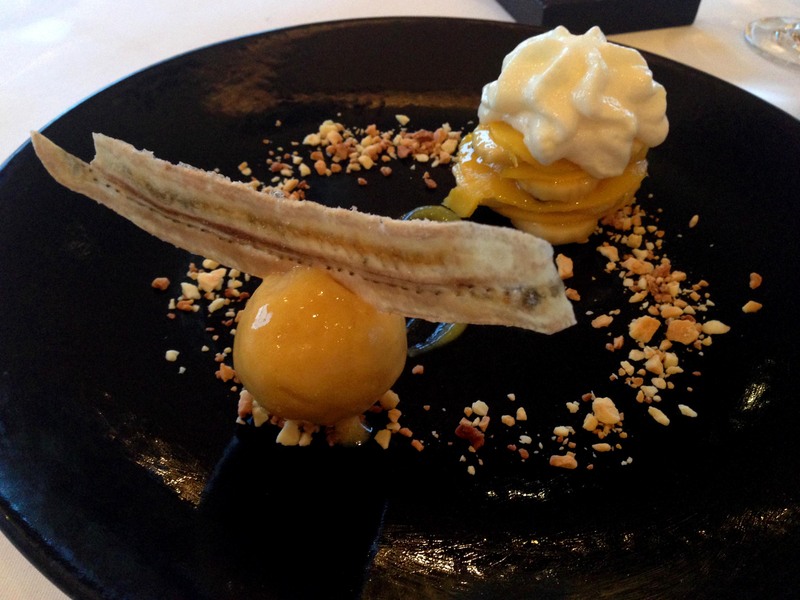 A very rich and decedent dessert. I had something more traditional yet equally as delicious. 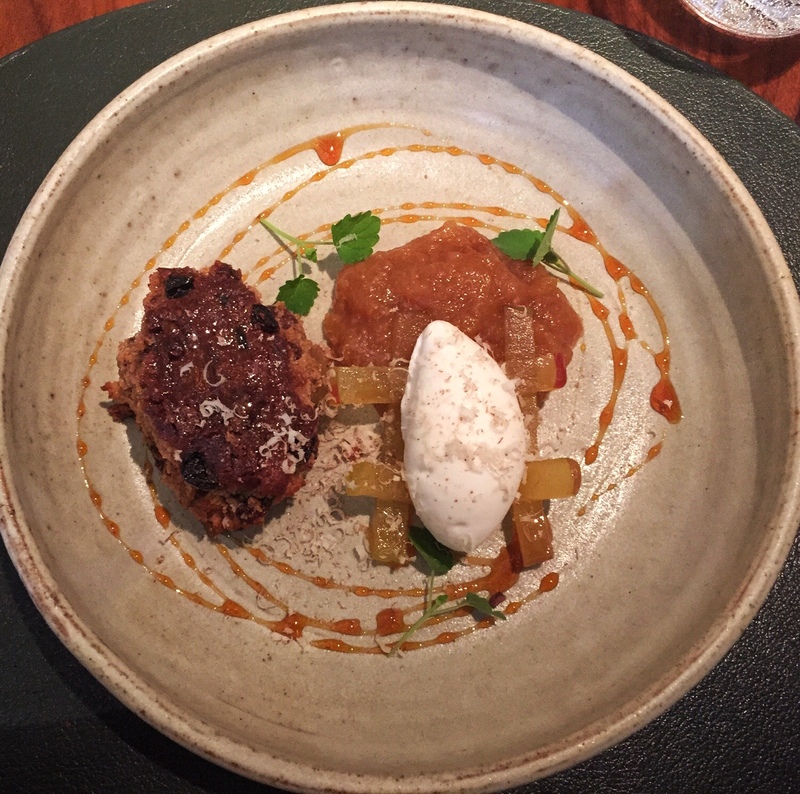 Bramley apple cake with cinnamon ice cream and pecans. The cake was freshly baked and warm, such a comforting feeling in the mouth. The pops of pecans added another dimension to the dish, delicious. 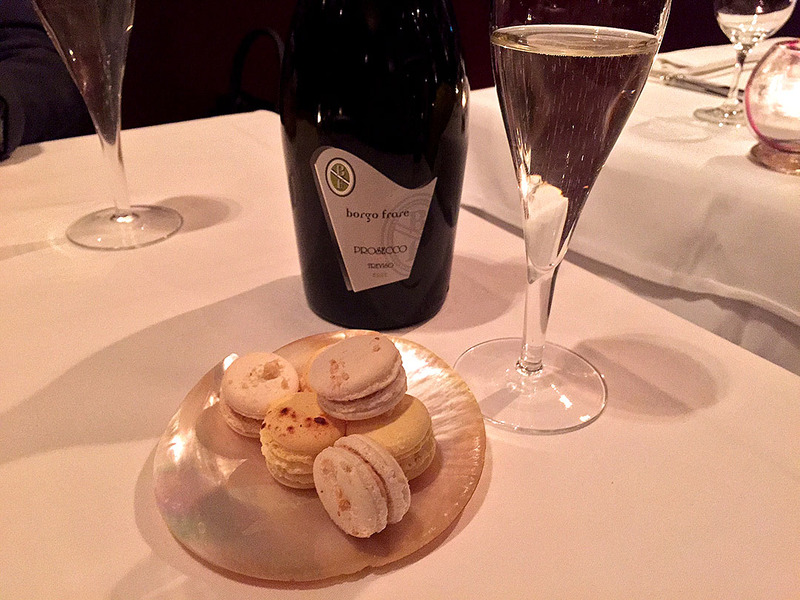 As we paid for our for our stunning meal we were given some sweets to leave us with the sweetest memory. Marshmallows and fudge, small yet intense. A special meal for a special Sunday. 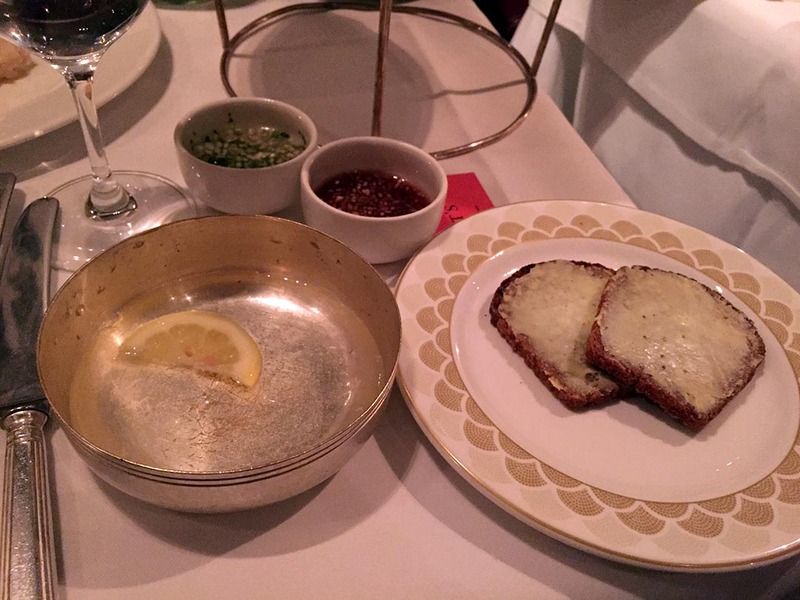 There was a touch of class and luxury for every step of this meal, something we could easily get used to. 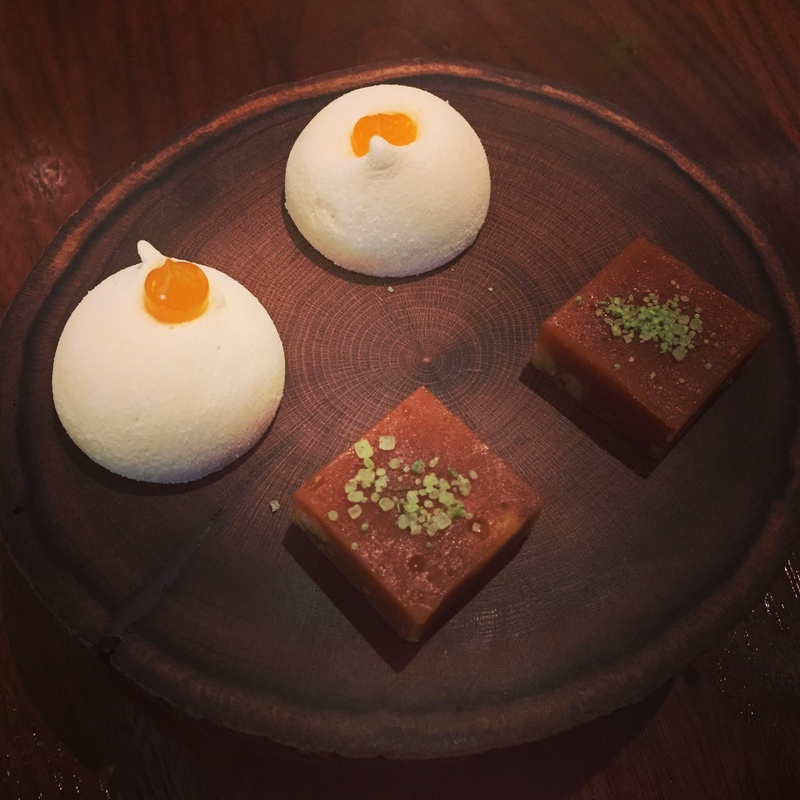 We can not wait to have an excuse to come back to Fera at Claridges. 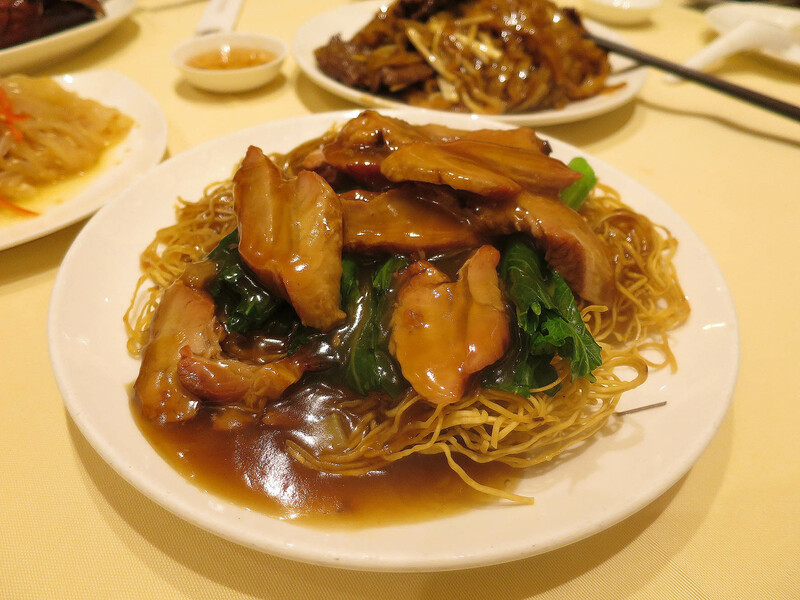 ‘I want roasted goose’, the chant we couldn’t stop hearing from our friend Birth who joined us in Hong Kong from Thailand. So on our last day we went to the prestigious Yung Kee Restaurant near Central Station. Yung Lee’s roasted goose is so famous that they offer a packaging service for their goose should you wish to take it on a flight home. Of course, our friend Birth had to take advantage of this service as soon as we arrived and got them to prepare two whole gooses to take back to Thailand. 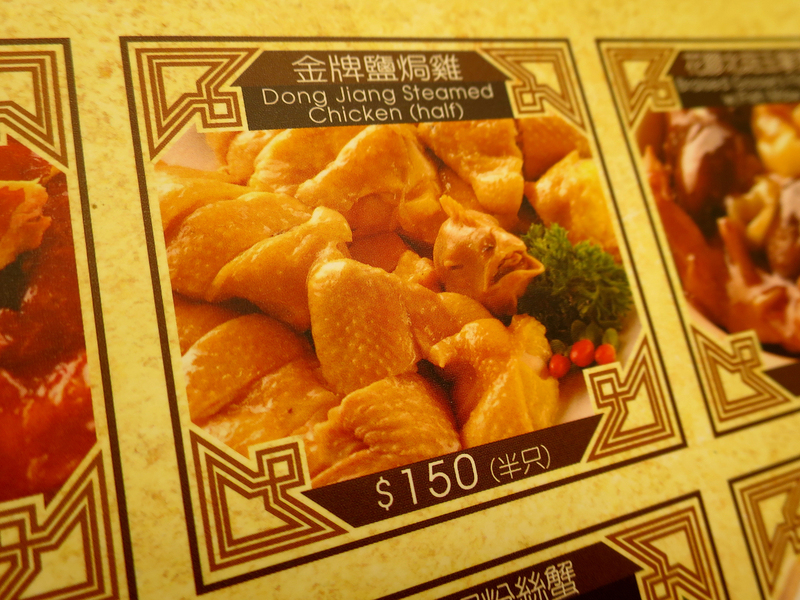 He paid a whooping 1200 HKD for two roasted gooses so you can imagine how pricy the rest of the menu is going to be. 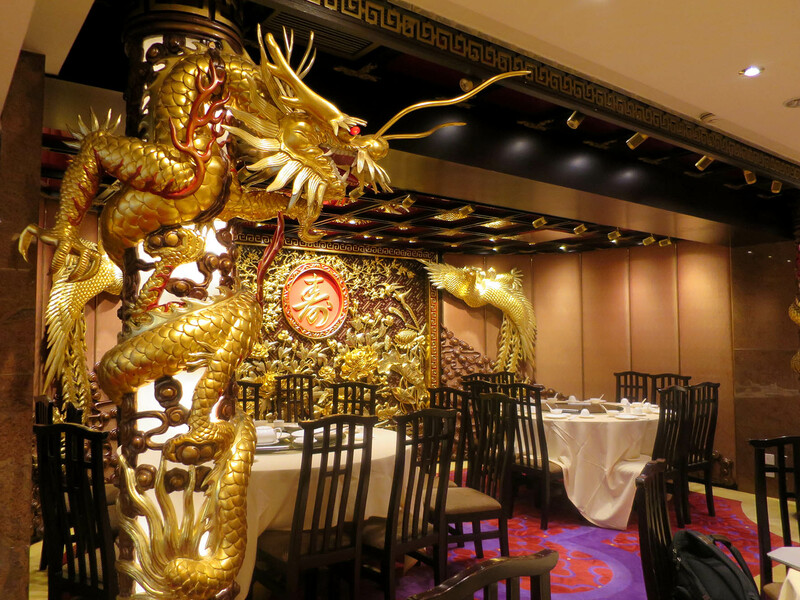 The decor is very stereotypical of what we would class as a ‘Chinese’ restaurant with the rich and royal colours of gold and red, Ming vases and gold Chinese dragons. It really is a treat for the eyes. 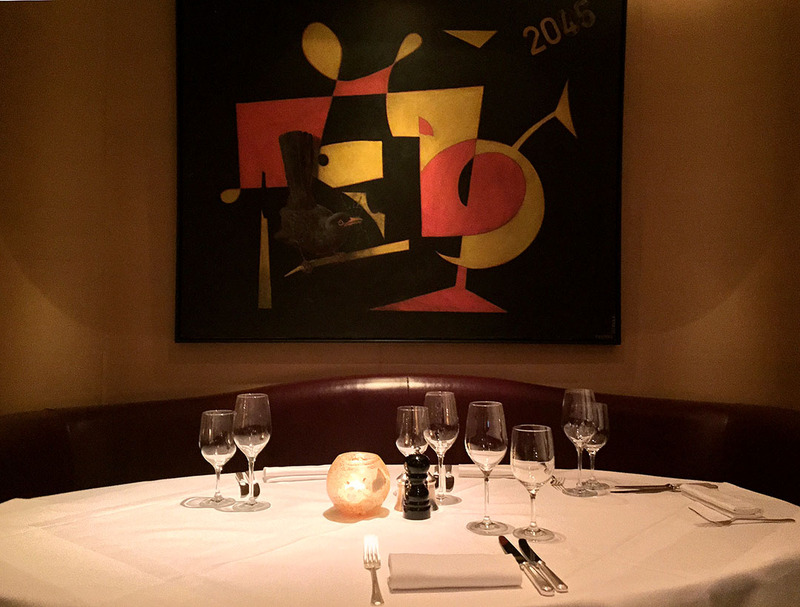 The restaurant has been running since the 1940s and it has that air of class and elegance from this period. 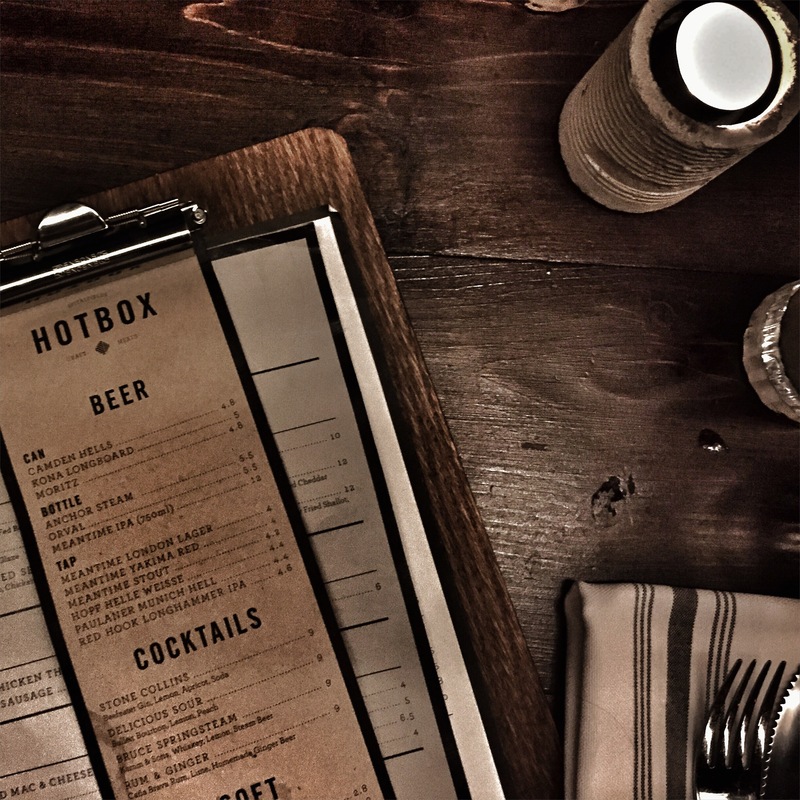 The restaurant are so proud of their accomplishments over the years that the first five pages of their menu are dedicated to the awards that they have one. 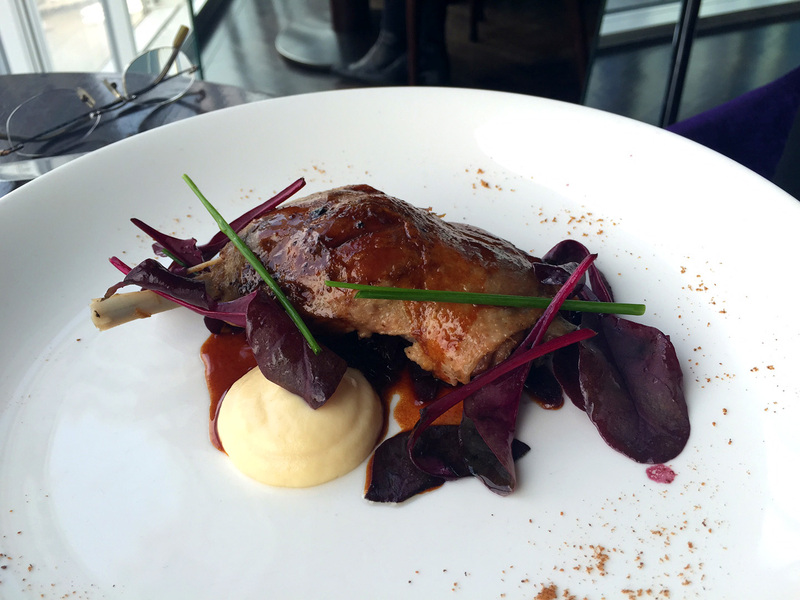 Naturally we ordered the roast goose for ourselves but only a quarter for 200 HKD. Honestly, I’m not sure what all the fuss is about and it was the first time I have eat goose and I won’t be rushing to eat this meat again. The glaze which was used to make the skin so crispy was nice and sweet but after two slices I couldn’t eat anymore. 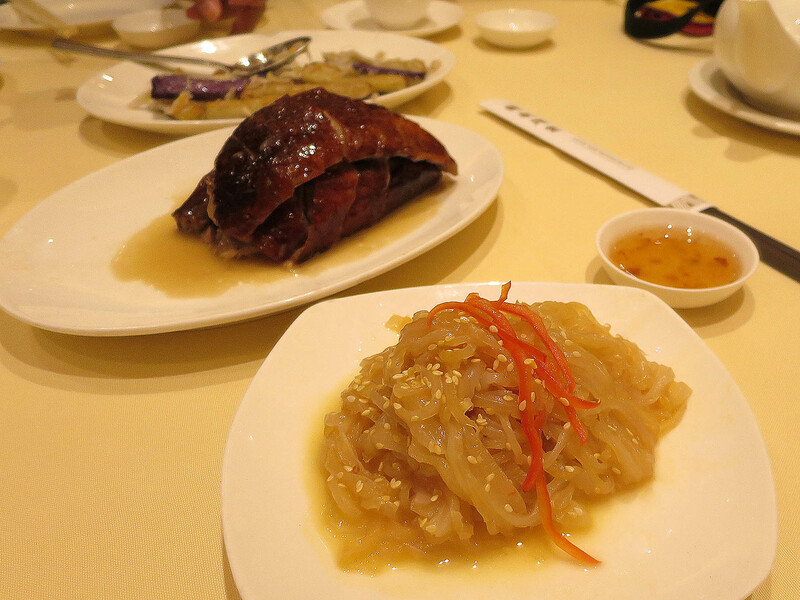 It’s a cold dish with translucent jelly strips and sprinklings of sesame seeds. Looking at the dish you would never think it’s jelly fish. Taste and texture reminds me of seaweed. However, we could only must a bite or two before the idea of it being a jelly fish we were consuming became to haunt the tummy. 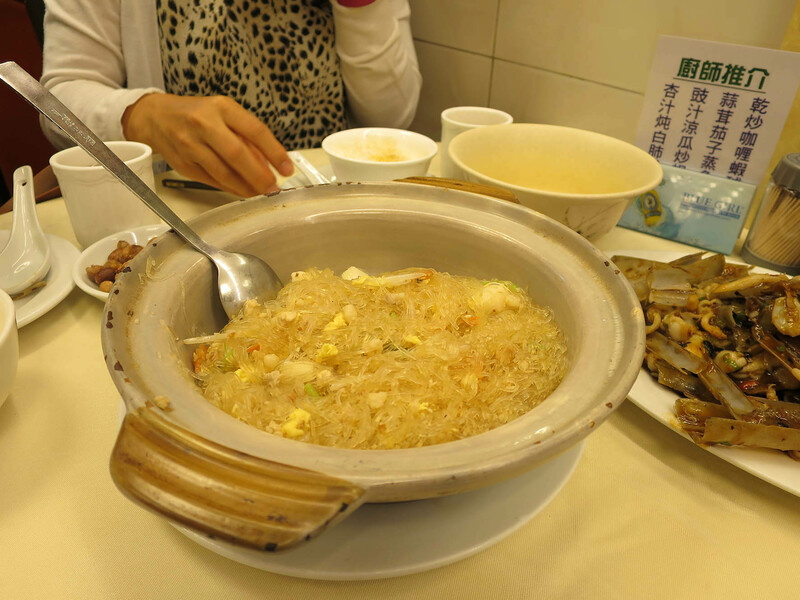 We also ordered prawn fried rice, BBQ pork vermicelli noodles, beef flat noodles and egg plant with crab meat. 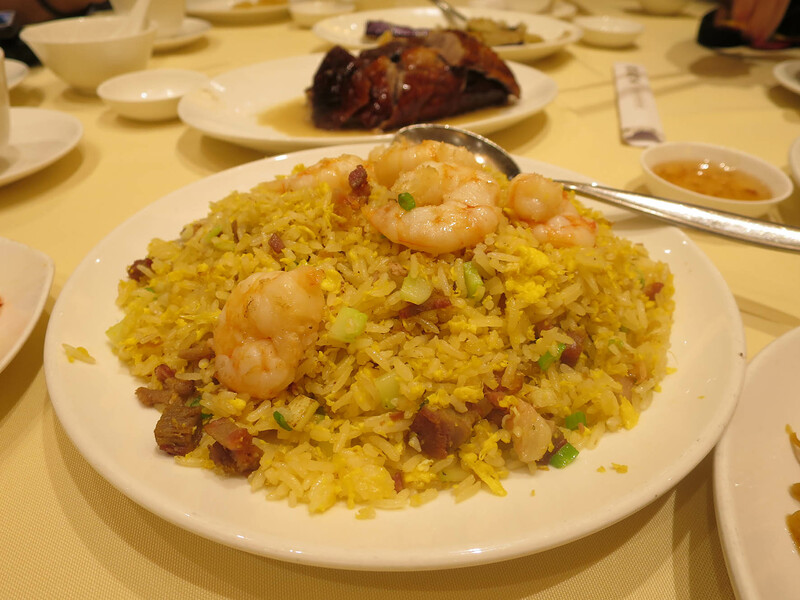 Now, I’ve mentioned this before, if you avoid pork and try and follow a halal diet you need to be careful in Hong Kong, they love putting pork into the most strangest dishes without even stating so in the menu for example putting it on top of a seasonal vegetable dish or in this case cutting it into chunks and putting it into a dish called prawn fried rice. Best advise I can offer is to speak to the waiters that can communicate in English and make it very clear that you can’t eat pork. However, I’m sorry to say that some lie so it’s best to have a friend who speaks the lingo. Anyway, rant over. The food here is good but out of everything we have eaten it is nothing to rave about. It is a good tourist attraction to just say you have been here. 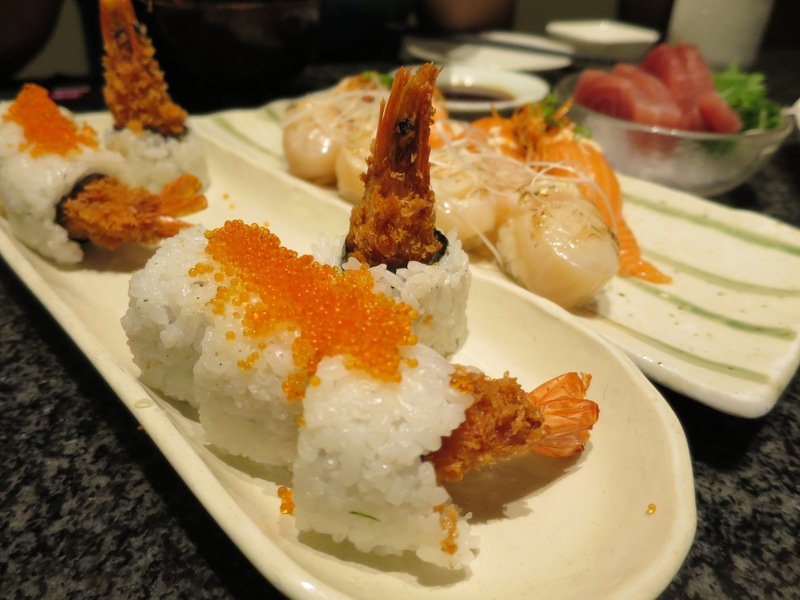 For what we were eating the total cost was ridiculous and the bill came to 1,298 HKD between four people. It was the only place that has charged for green tea for our entire stay not sure how that can be justified. 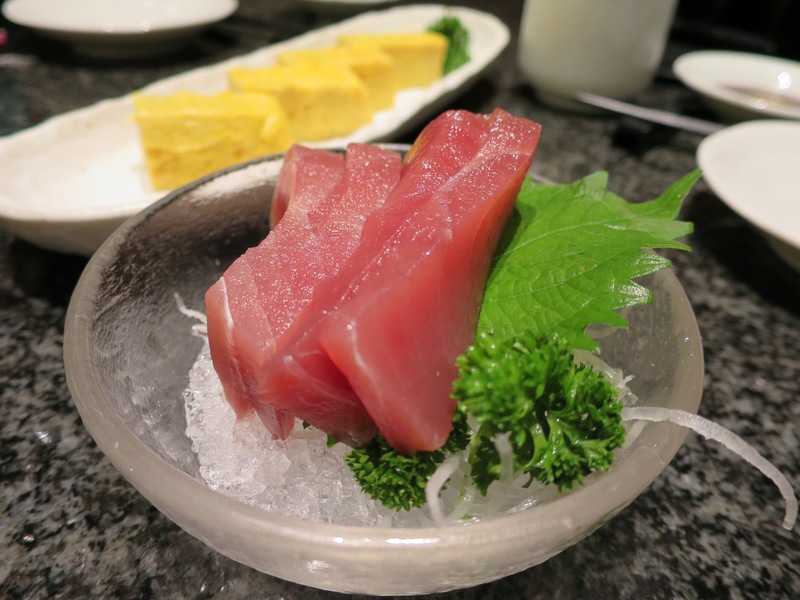 Being in Hong Kong a country surrounded in water you are guaranteed to have some amazing fish. 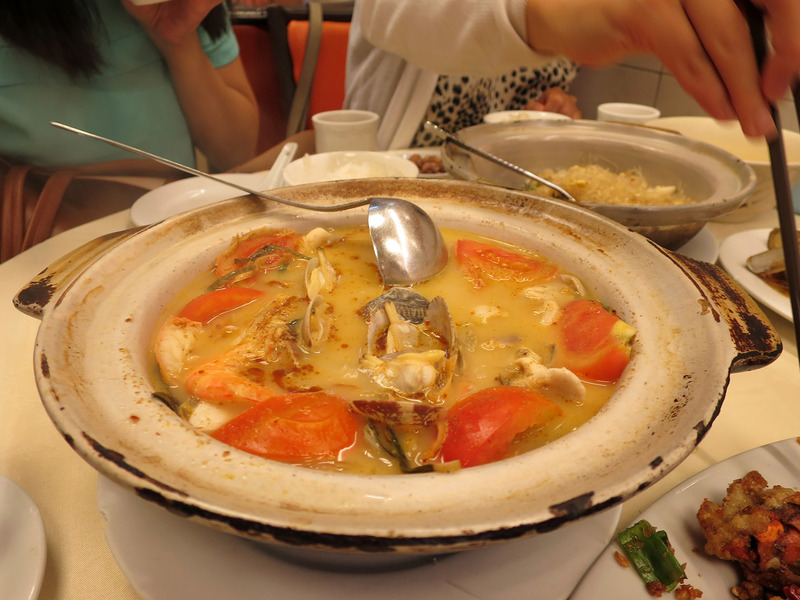 We had to find the best seafood in Hong Kong and I’m pretty sure we have come close to it. 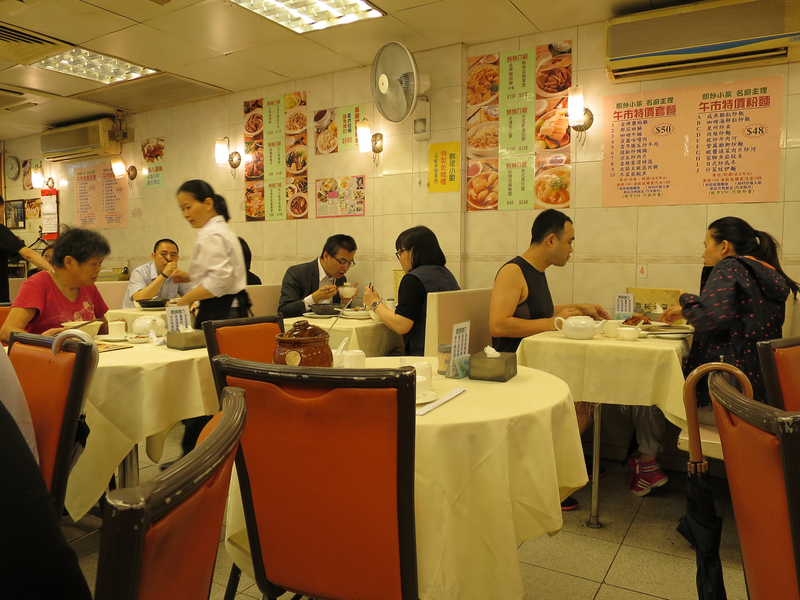 In the back streets of the Wan Chai district is a little restaurant where you see the integration of the expats and the locals over the fruits of the seas. Crowd Restaurant on Gresson St is a small local restaurant with no frills so expect to be seated shoulder to shoulder to strangers. As we sat down to feast our expat friends started doing the most unusual things which we now understand are standard practice in places like these for good measure. 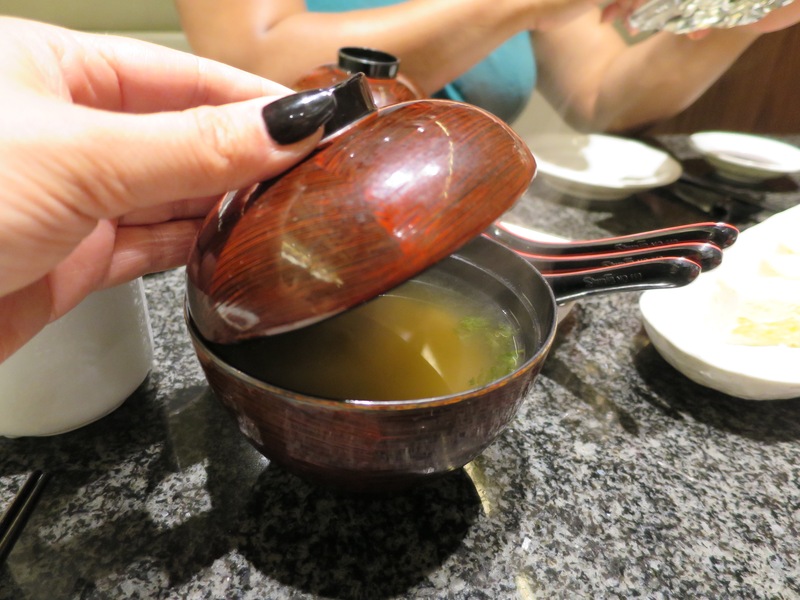 The waiters gave us our chopsticks and crockery and a teapot of green tea. One of our friends proceeded to wash the chopsticks and crockery in the green tea to clean them. We noticed the other tables were also conducting this process. We found out that even though establishments like these washed their utensils people preferred to re-wash them for hygiene assurance. 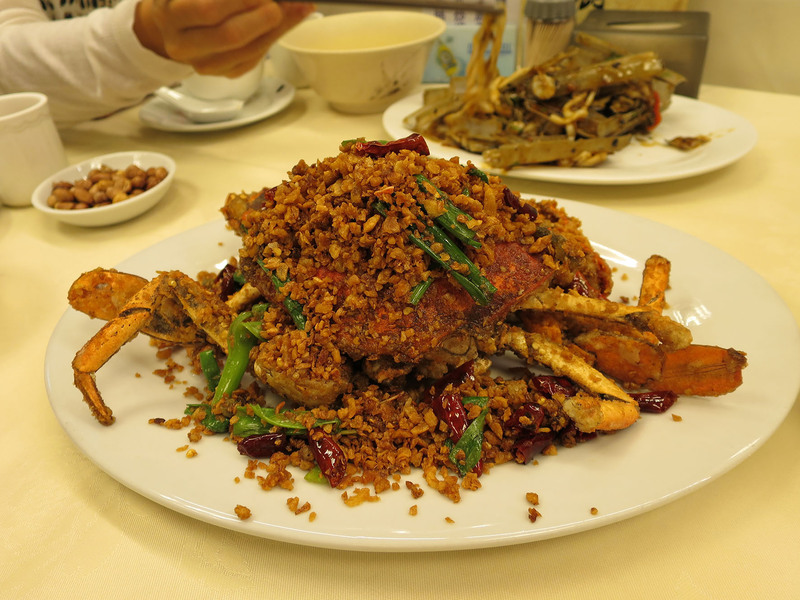 We ordered the famous Hong Kong hairy crab that everyone kept telling us about. 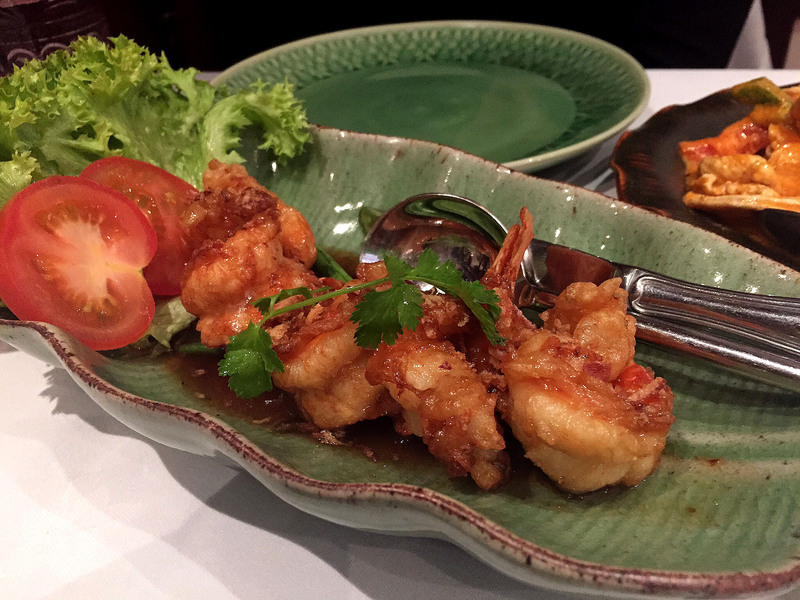 We also ordered: razor clams, Thai seafood soup, scallop and prawn stir fried vermicelli noodles and sticky rice. 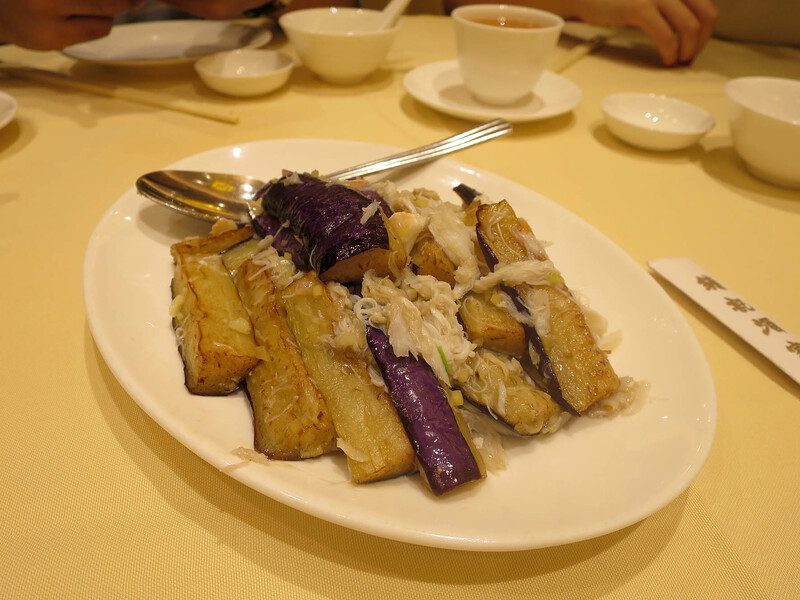 The hairy crab is covered in fried garlic which is lovely with the crab meat. 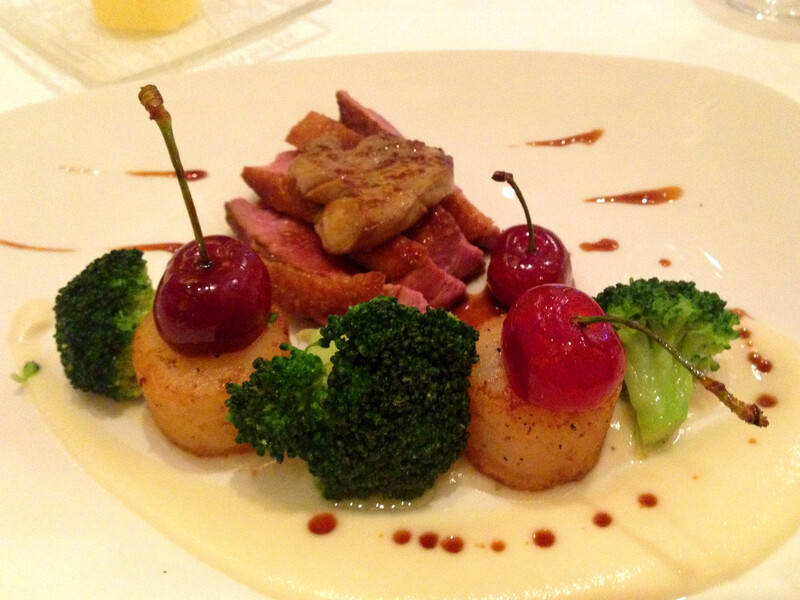 It was the most expensive dish on their menu costing 200 HKD but so worth it. 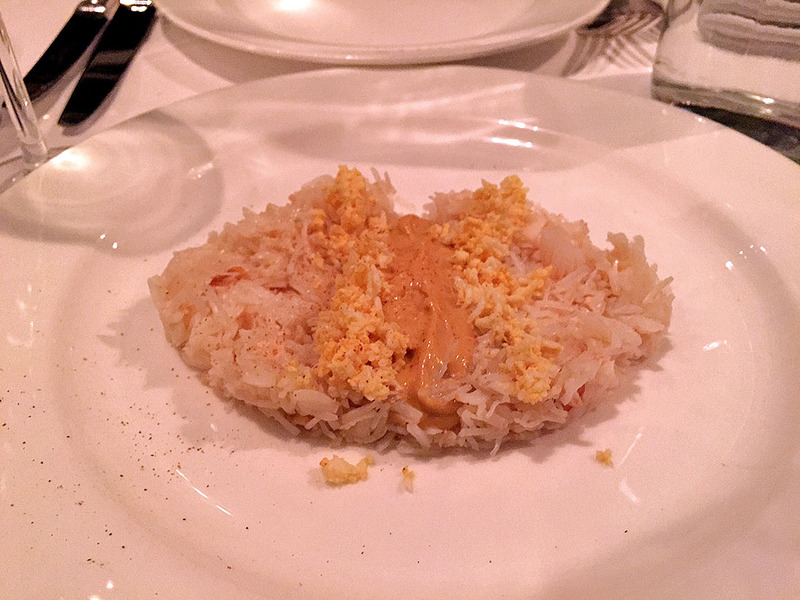 The crab is covered in batter and deep fried which makes you keep licking the shell. Damn, my mouth is watering just thinking about it. 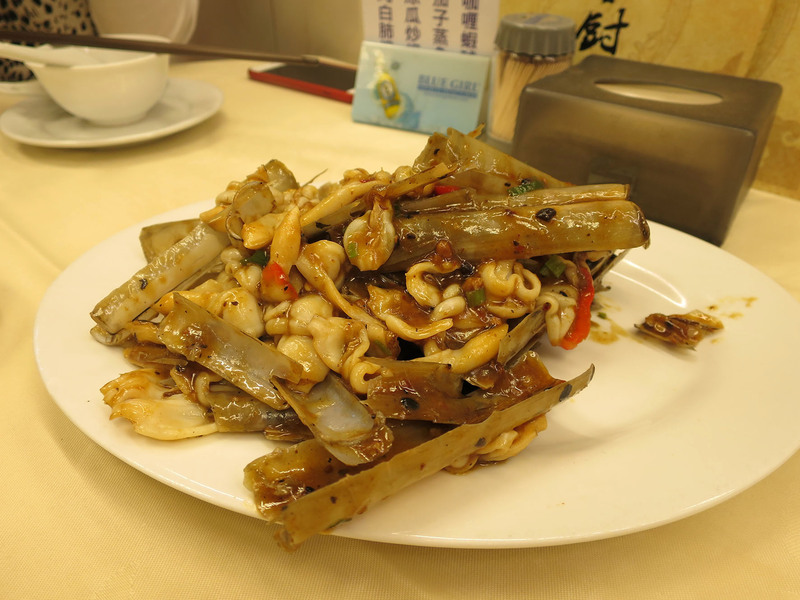 The razor clams look so odd, almost like small pieces of bamboo that have been split open. They are coated in black bean sauce so go great with the rice. 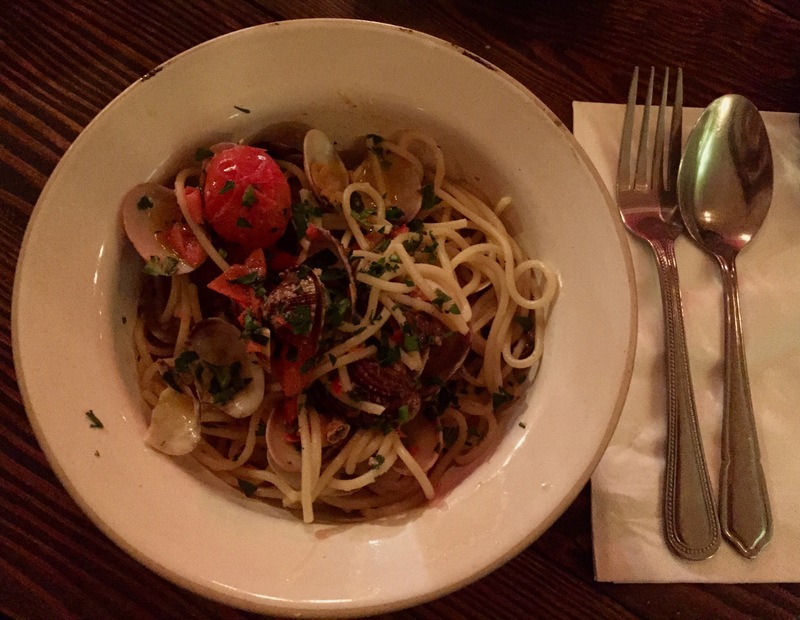 The meat in the clams isn’t the perfect oval we are used to so prepared to pull something stringy looking out of the shell. Don’t worry, it tastes better than clams. Our favourite dish was the scallop and prawn stir fried vermicelli noodles. I for sure couldn’t stop eating it at all. The noodles we so light with a generous helping of scallops and prawns fresh from the sea. 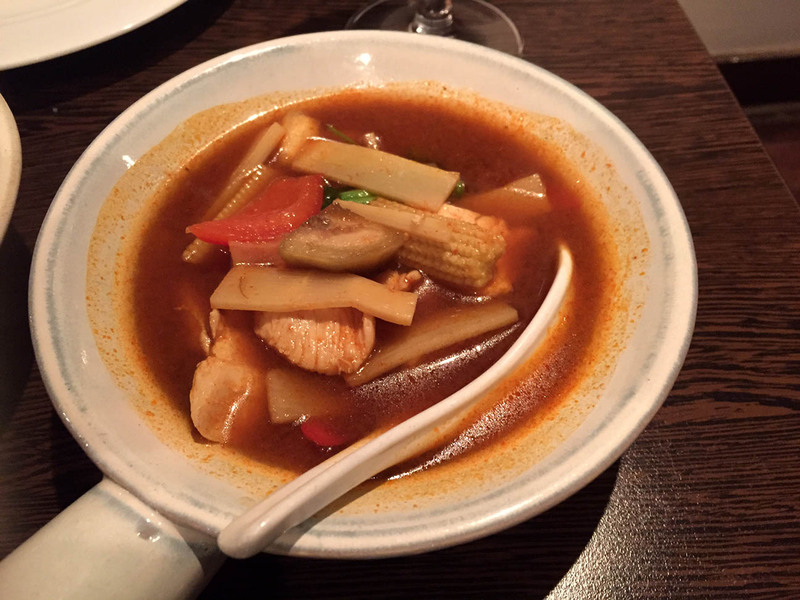 The Thai soup had a different range of fresh and tangy flavours which you naturally associate with Thai food. The food came to a grand total of 680 HKD between five people were we’re stuffed. 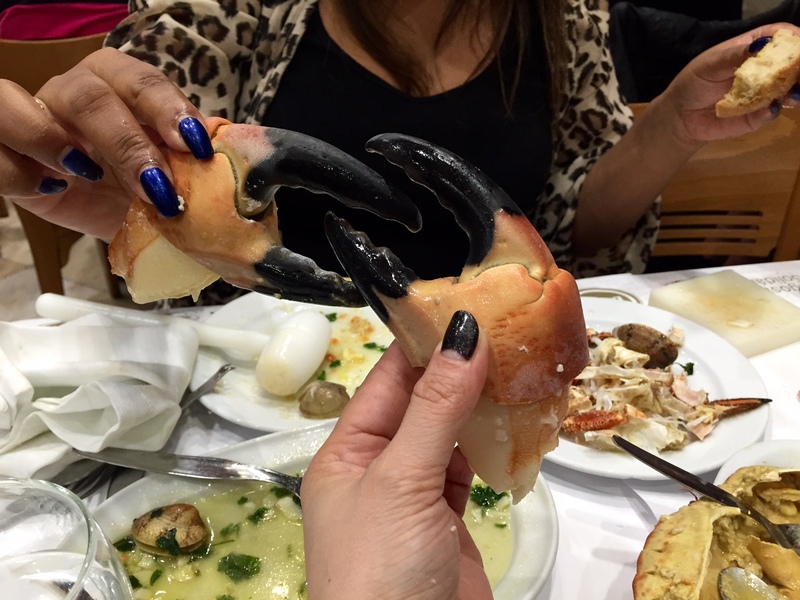 Paying £13.60 each for the amount of fresh seafood we consumed feels like we were almost stealing. 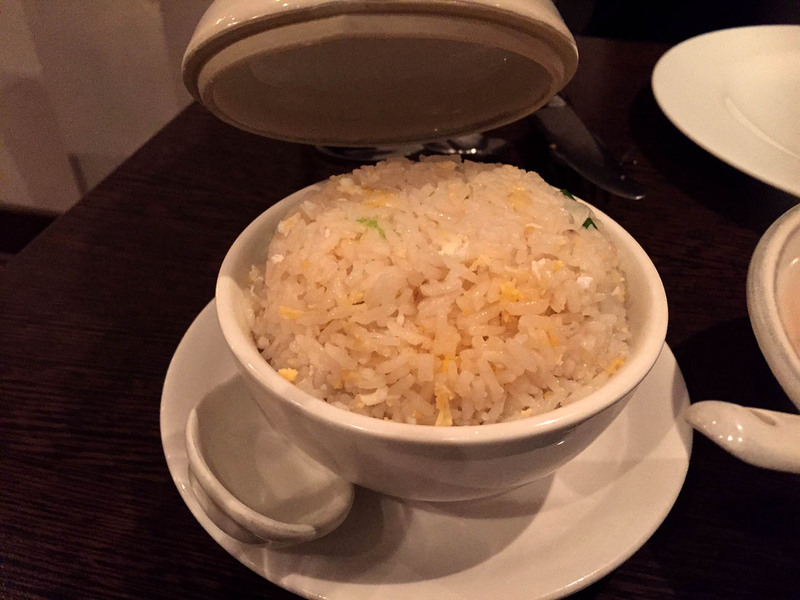 If you don’t mind a tight squeeze in a charming local dine then definitely visit Crowd Restaurant. I love evenings in Surrey, driving around the country lanes and looking at the amazing home I can’t quiet afford. 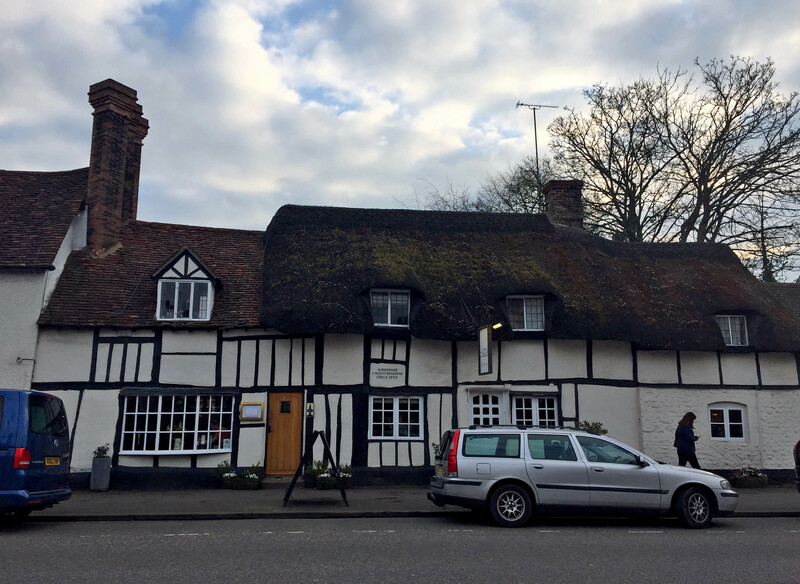 There is another positive for Surrey, it’s full of little gems to dine in such as The Greedy Elephant. 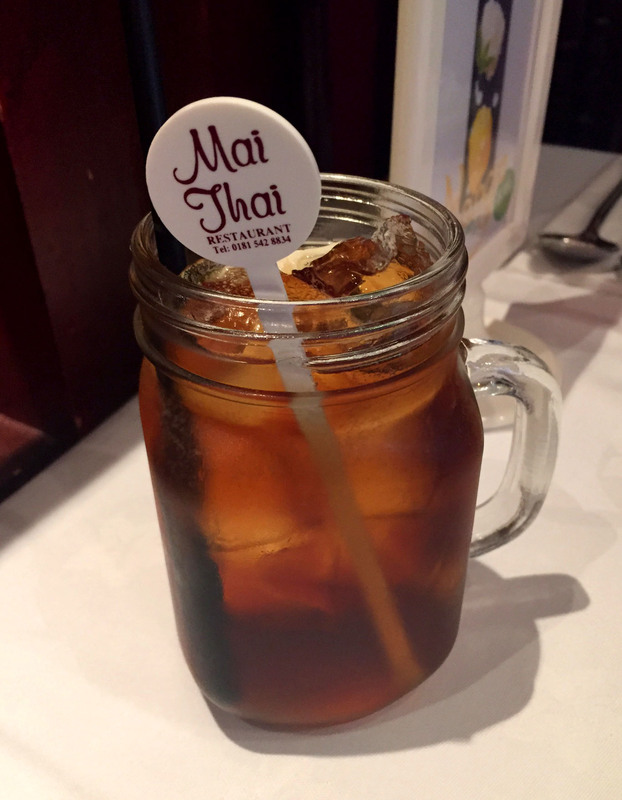 Rumored to have the best Thai food in Surrey, well I had to put my fork to the test to see just how true this was. So off I went to Weybridge to find The Greedy Elephant. The menu is huge!!!! So it does take a while to go through it all. The complimentary prawn crackers helped to sooth the process. 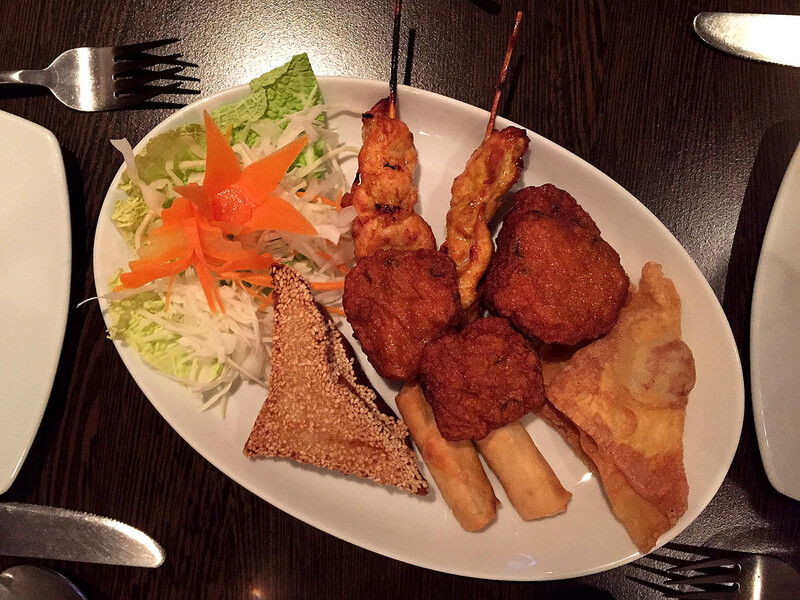 We were so confused about which of the 50 starters to pick that we decided to go for the selection platter with: fishcakes, spring rolls, prawn toast, chicken satay and prawn parcel thing which wasn’t on the menu but tasted amazing. For the price of £16.95 I had to question whether it was really value for money at all, it was definitely a nice dish but not worth the hefty price tag which is ridiculous when you compare the price to the rest of the dishes on the menu. On the plus side chicken satay has to be the best I have ever tasted, tender and it actually tastes of something, spicy with a tender texture. The fish cakes where juicy and chewy and packed full of flavour, you could see and taste the fresh herbs in each cake. With regards to presentation I always think that the Thai have the most incredible presentation with knife craft and use of fresh flowers in the aesthetics of the piece but here the presence of that Thai attention to detail was lacking. Again this make you question the price tag of this dish. 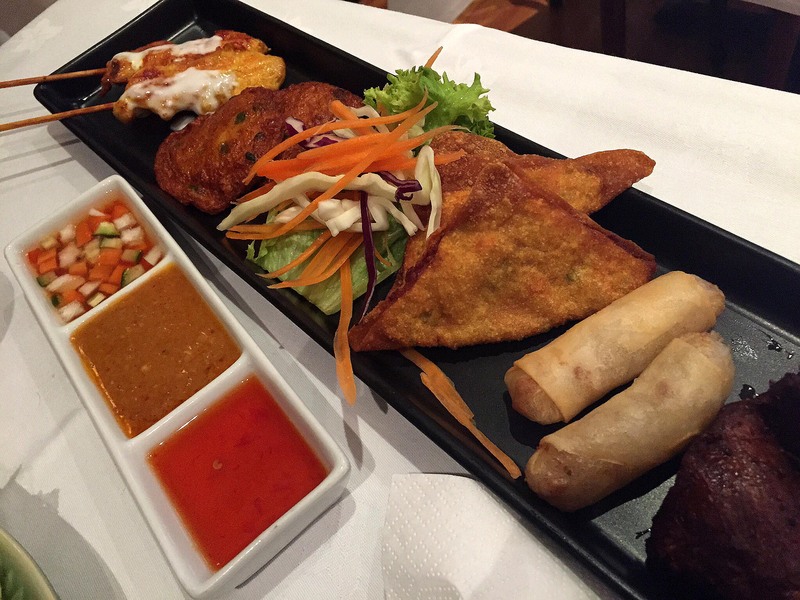 The mains are more reasonably priced and the quantities are far more generous than your average Thai restaurant. 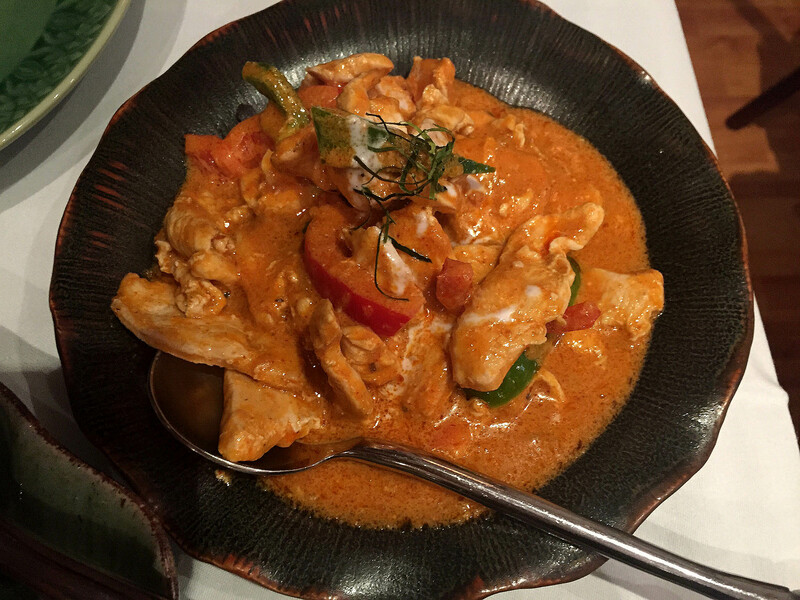 Each curry could be shared by two. This definitely made up for the excessive spend on the starters. 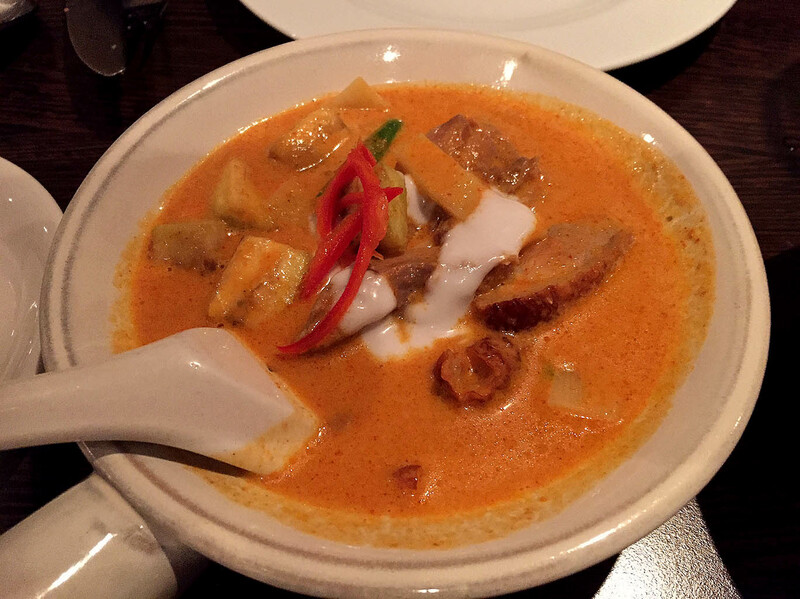 We ordered the jungle curry with chicken and the roast duck curry. OMG, usually the duck curry is never something that I would have considered but boy was this a good choice. It was creamy with all that coconut milk and the duck pieces had crispy skin and tender meat which just melted in the mouth. The vegetables were soft and I am a fan of the baby Thai aubergines. The menu stated it had pineapple in the dish wish I wasn’t keen on that idea but I think it was blended into the sauce as there were no chunks. The jungle curry was nice but nothing to rave about. A very watery consistency and the chicken itself was rather pale and unloved with flavours, so if you had a mouthful of chicken without the gravy it was rather bland. The beans and baby corn were lovely and crisp and added wonderful colours to the dish. 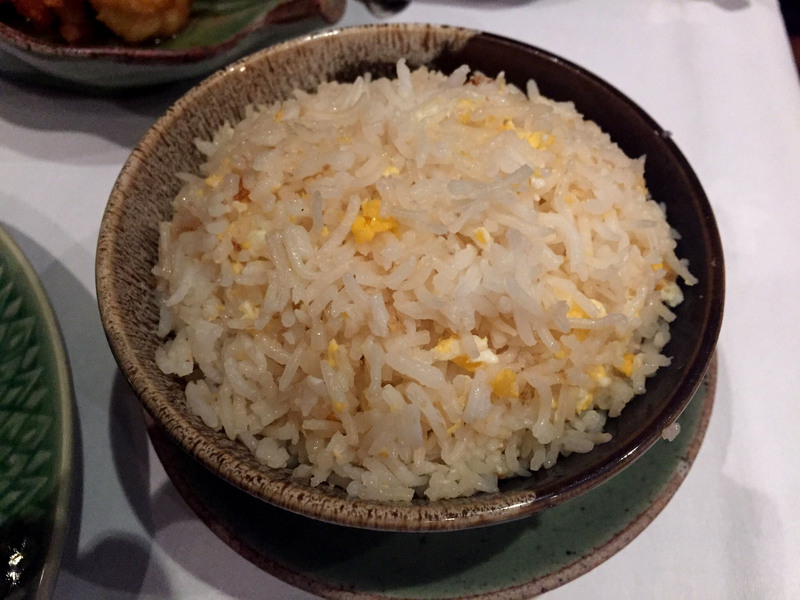 To go with our mains we ordered some good old egg fried rice which was fluffy and tasty and went really well with the mains. I’m not sure how I feel about The Greedy Elephant as the food is fabulous however the rudeness of the hostess was disgusting. I must mention the incident that took place as we paid and left. We asked the hostess if my friend and I could split the bill to which she smiled and said ‘If you want to split it, you work it out’, nicely we did and got up to leave and she just stared us out the door without a farewell sentiment. If you don’t mind feeling like you should be grateful for dining in the presence of the hostess for some good food then this is a great place. However, if you prefer service with a genuine smile (not the kind from the lady in Fatal Attraction) and a friendly atmosphere then this is not the place for you. Such a shame, The Greedy Elephant could be amazing if they just sort the service out. Found on every high street and for good reasons too. 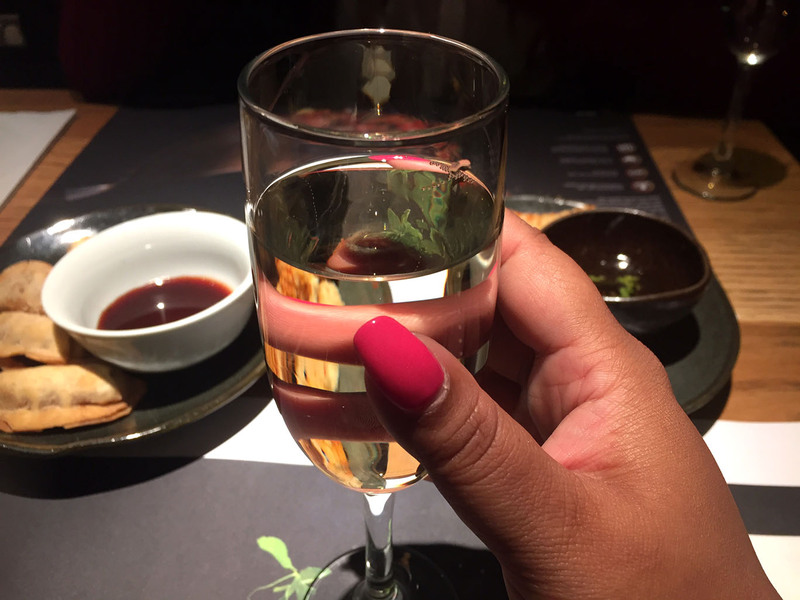 I must admit on my first visit to Wagamama I hated it, I was with another person and I just couldn’t get comfortable on their school bench style seating and having to get up close and personal to strangers. It really wasn’t an intimate setting at all so I boycotted it through my teenage years but then fell in love with it after giving it a second chance. 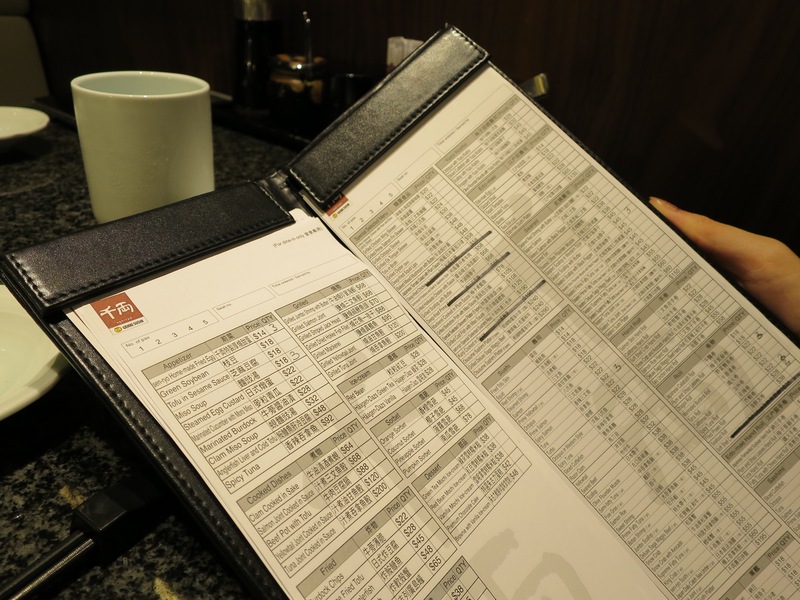 One thing I like about Wagamama is the ever changing menu and the different offerings at different locations. Some places you find sushi other places you find pho. 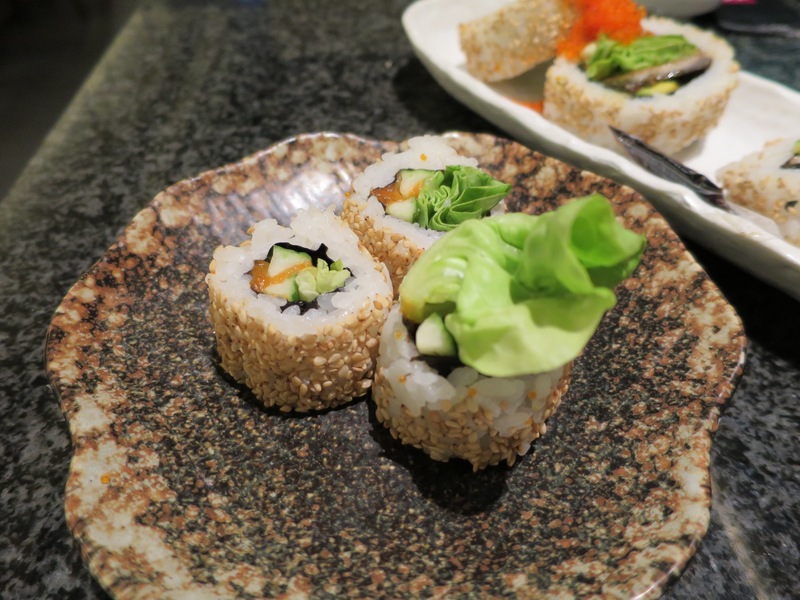 Pan Asian would be the best way to describe this cuisine. 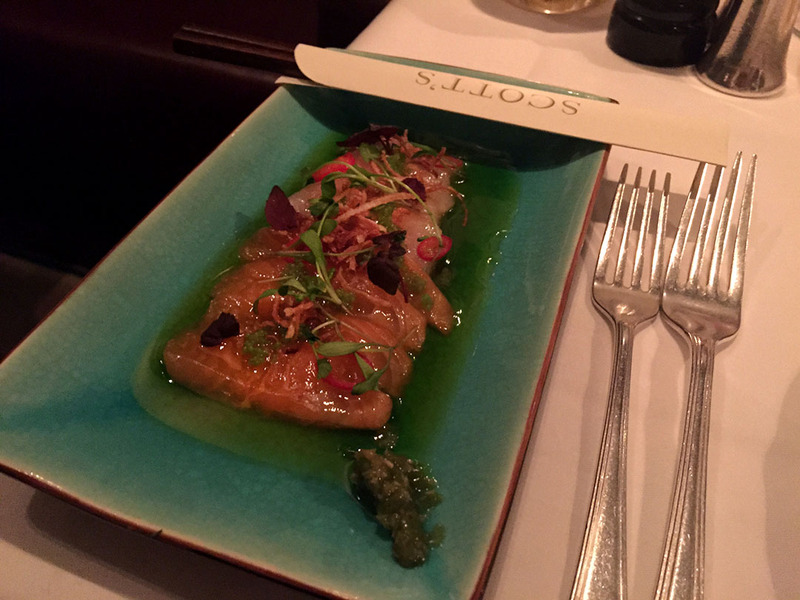 Some must have starters are their steamed soya beans also known as edamame beans with chilli or garlic salt. Great to nibble on and so fresh. 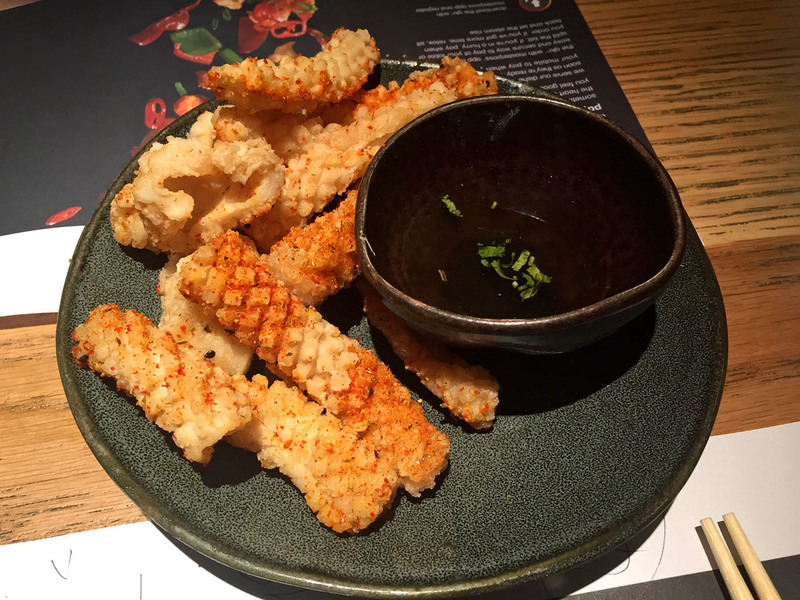 Two more must have starter are the chilli squid, crispy and chewy and packed full of flavour and they serve it with a tangy coriander and garlic dip which enhances the flavours. The last is the gyoza and I mean any of these steamed or fried. 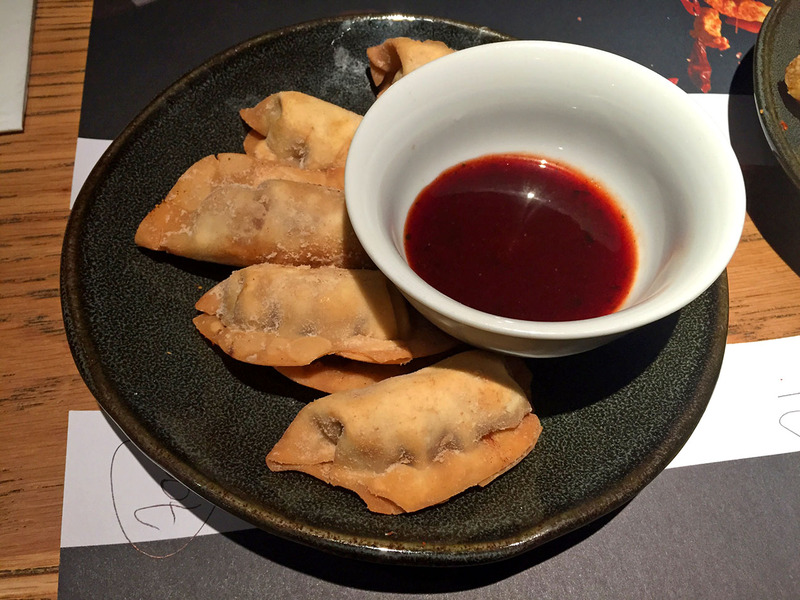 On this visit we tried the duck gyoza fried served with a hoi sin sauce. 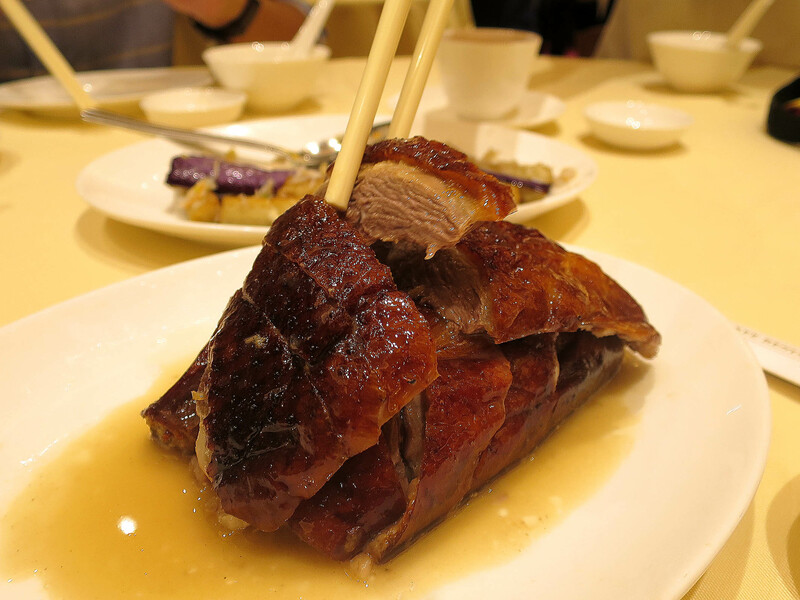 The duck is so juicy and tender which is a skill to achieve with duck as most cooks and foodies will know. Number 71 has always been my favourite dish. The Chicken Katsu Curry, as always I asked for extra curry sauce as I like my food to be hot and wet. I have the oddest way to describe this dish yet if you like the two food I am about to say then you will get what I mean. 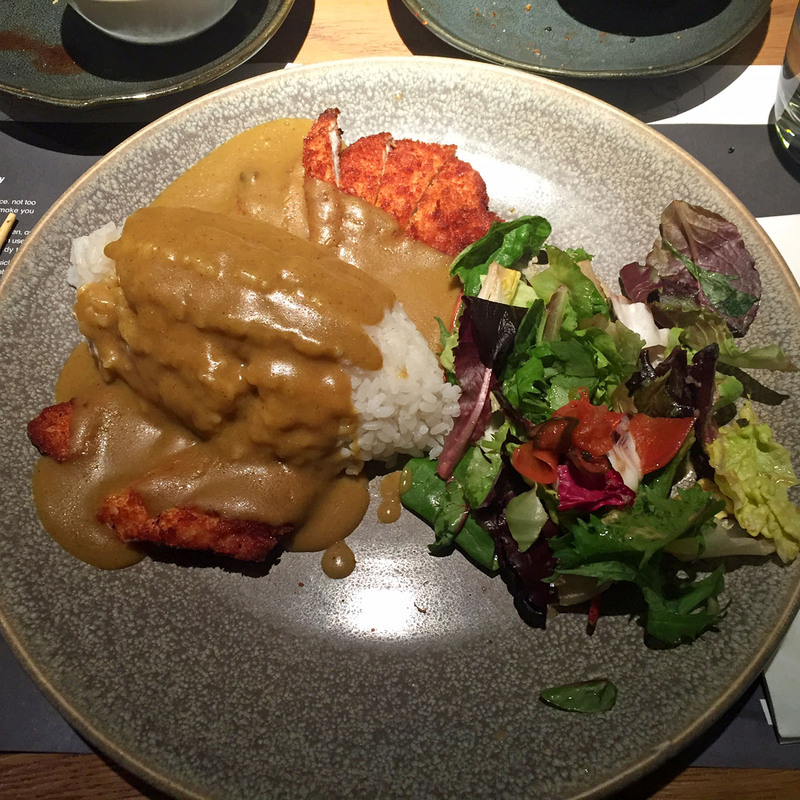 If you are a fan of fried chicken and curry then the Katsu Curry is basically the happy medium between the two. Chicken breast coated in breadcrumbs, topped with rice and smothered in curry sauce, served with a side salads and pickles. I love this dish and just can’t get enough of it. If you are a veggie lover there is a veggie option which is just as good and instead of chicken you get sweet potatoes and aubergines which are under yummy. Dishes are served quick so unless you ask for your starters and main course to be served at different times they will arrive as and when each dish is ready if you don’t. So do make this clear when you are placing your order how you will like your dishes served. Service is generally pretty slow so don’t be surprised if you have to flag a waiter down to take an order or to get your bill. However, Wagamama are fully aware of this flaw and have recently created an app so that customers can pay for their meal and leave when they are ready. It’s a cheap yet satisfying dine with huge portion sizes so there is no way you will ever walk away from here hungry. Just be prepared to be a tad annoyed about service should you not have the app. Something I have had to ponder was how healthy Wagamama actually is. I’m currently on a mission to lose some weight so am always interested in how many calories are in each dish so I can pop it into my fitness app to keep track of how many calories I am consuming and burning. So for a restaurant that prides themselves on healthy and positive eating hub I didn’t even think this could be an issue for me. After a few clicks on their website in which they proudly display nutritional information I was horrified to find that the Chicken Katsu Curry was a horrific 1147kcal and Elena had beef noodles which came in at 993kcal!!! This made me exceed my daily target of 1400kcal! 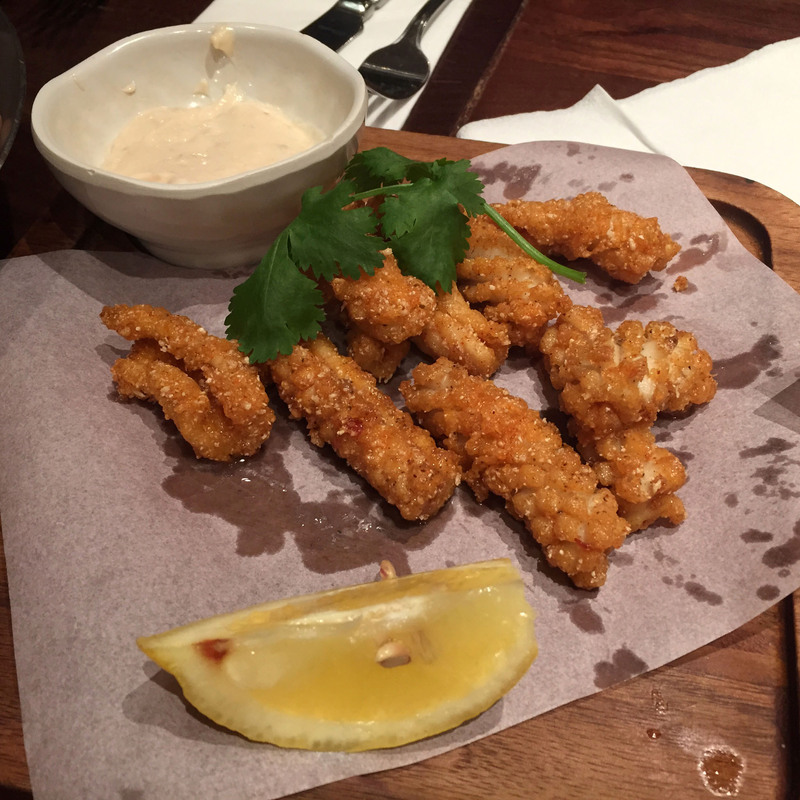 The chilli squid is 492kcal!!! The duck gyoza is 292kcal!!! Now we understand that in theory each ingredient is healthy and nutritious however, can Wagamama really justify stating they are a positive eatery when one meal is more than half the daily calorie allowance for a female of 2000kcal? Is McDonalds healthier than Wagamama with fewer calories? 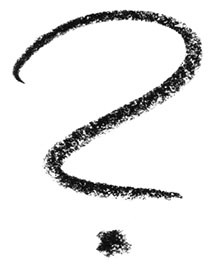 It would be interesting to know your thoughts on this. When we go to Edgware Rd in the late evenings it’s like we have entered a place where time doesn’t exist. The streets are always busy, families are out with their children, the restaurants are packed and open at all hours and there is a friendly hug and ‘salam’ between passers by on rotation. It is such a happy street of Arab cultures and best of all Middle Eastern food. We have been going to Al Arez since we were teenagers. The charm of shisha being smoked outside and well cheap food is always an attraction to an adolescent. However, the food is what keeps us coming back as our lungs can’t handle the shisha pipes anymore. 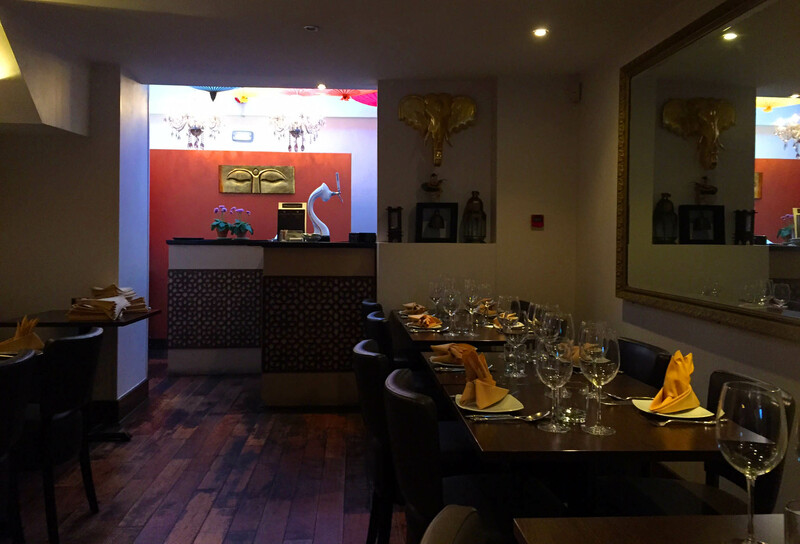 The menu is Lebanese and the service is Middle Eastern in style, very friendly and charming. 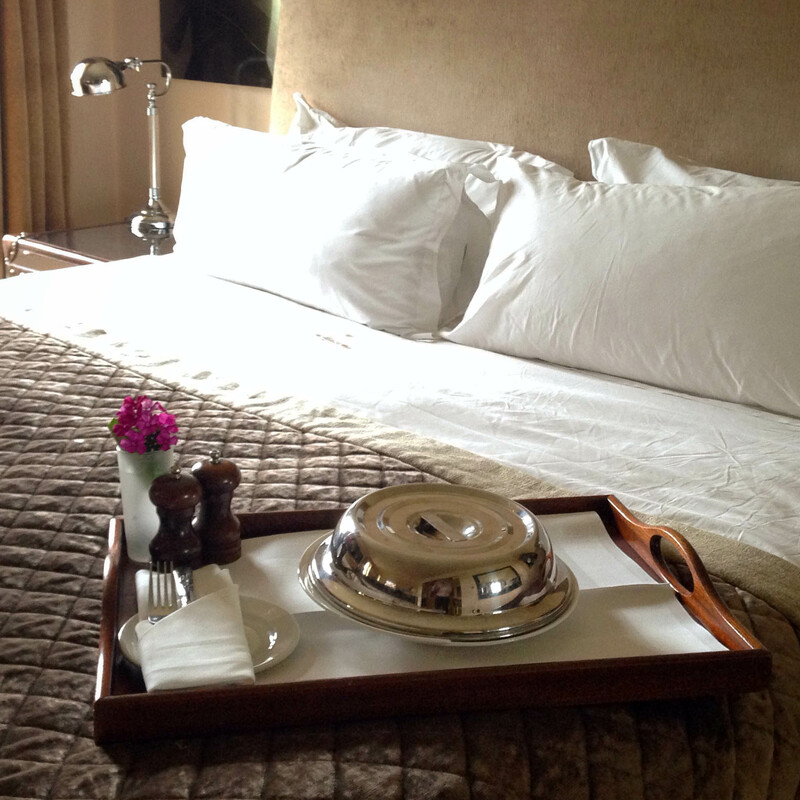 Depending on the day and what they have to offer you are served complimentary dishes upon arrival. One staple complimentary item are the Middle Eastern pickled peppers and olives which are a treat. This is the restaurant in which we fell in love with the fattoush salad and since no one has been able to match up to it. So naturally it is the first thing we order. 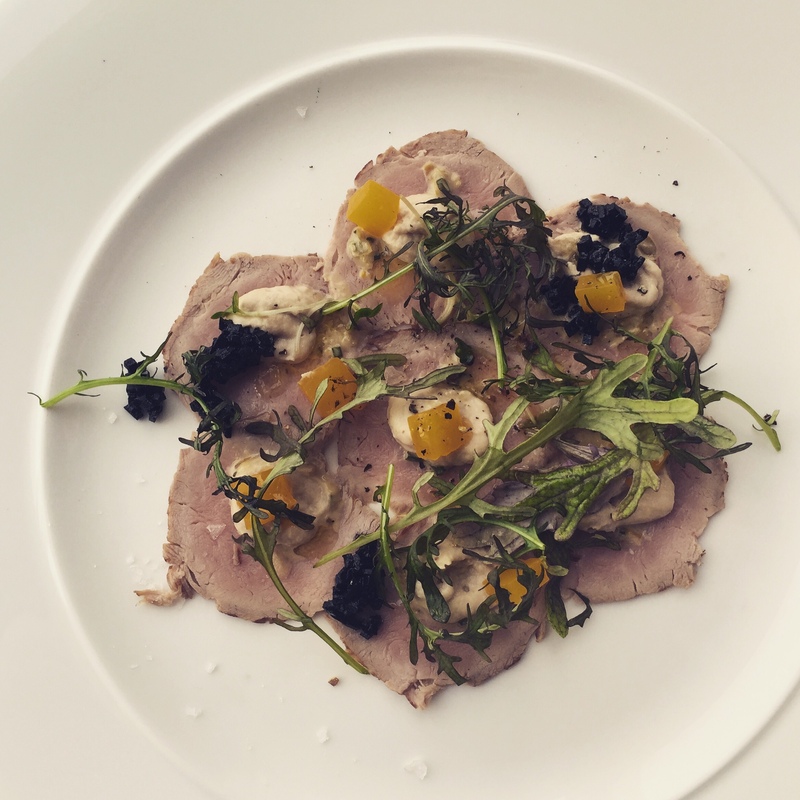 The crunch, the hit of sour and tangy flavours, the juiciness of the salad vegetables, so mouth watering. I always as for extra croutons for that extra crunch. 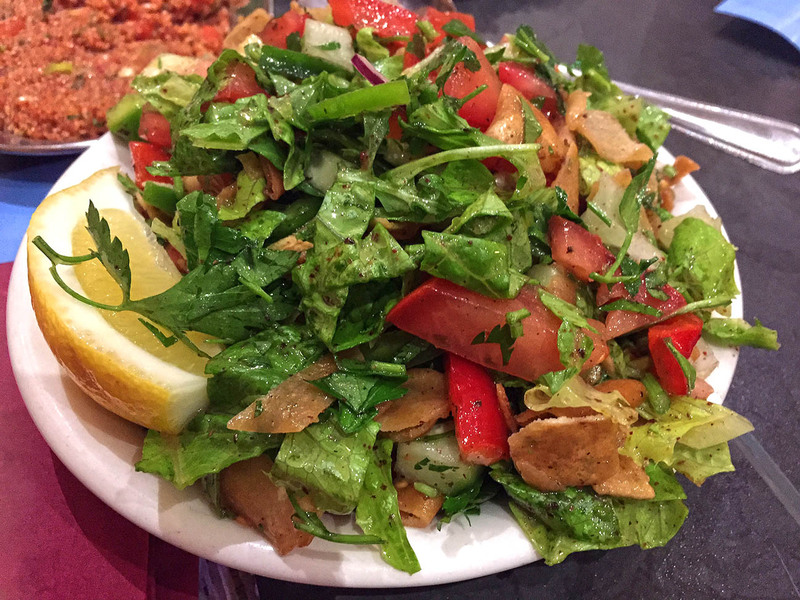 When we go to any lebanese or Middle Eastern restaurant we always opt for a tapas style of dining so lots of little dishes and maybe one meaty main to share. 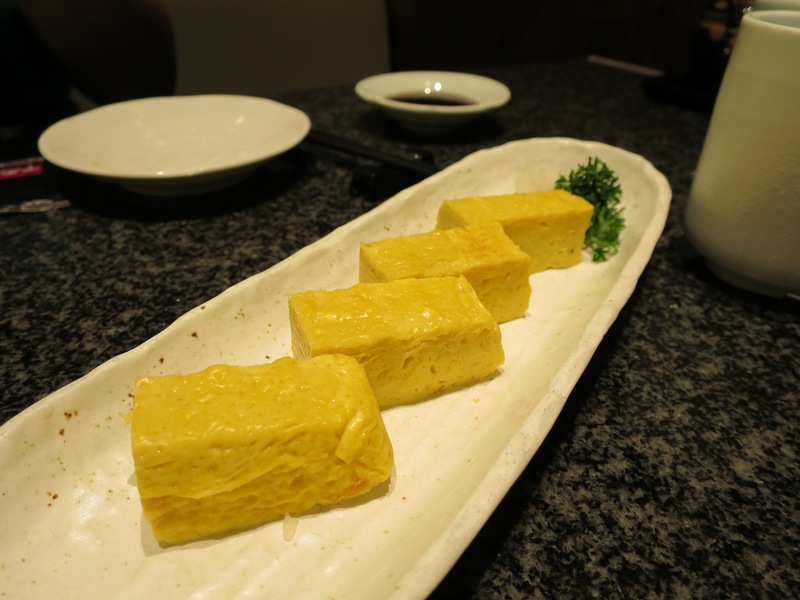 It’s the best way to make the most of all the dishes that they have to offer. Don’t know be scared to get stuck in with your hands and make a mess, it’s the thing to do at Al Arez. Staples to recommend are the hummus shawarma which is freshly ground hummus with grilling lamb on top, great to scoop up with the fresh Lebanese bread they have on tap. 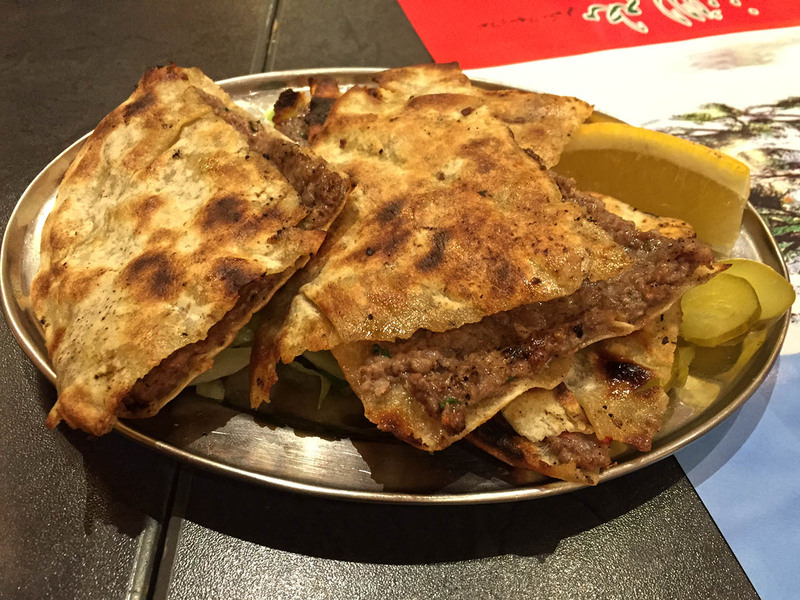 We would also recommend the Arayes Al Arez which is grilled lebanese bread stuffed with spicy minced meat, the bread is uber fresh and my meat just melts in the mouth. I suggest you smother it in the delicious garlic sauce they make in house. 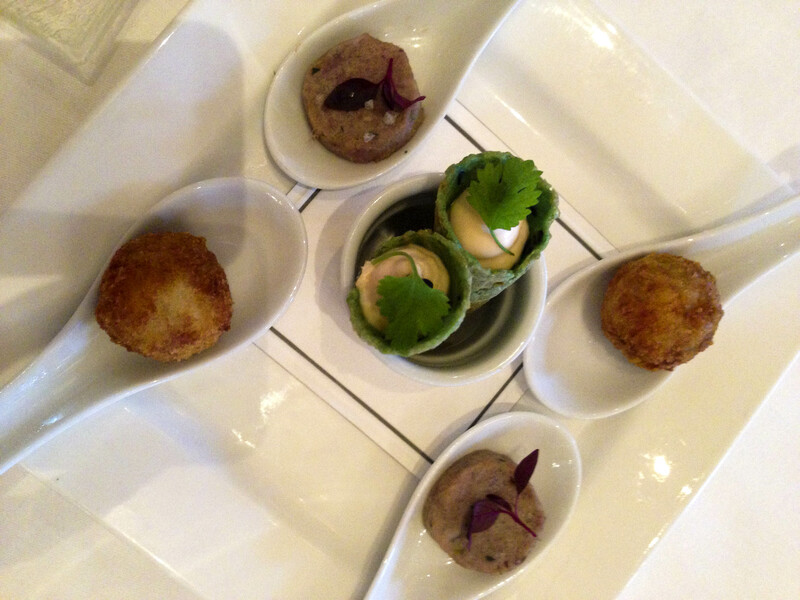 The kibbeh is also a lovely dish which has a cracked wheat shell and a juicy meaty centre. Perfect combination of protein and carbs. 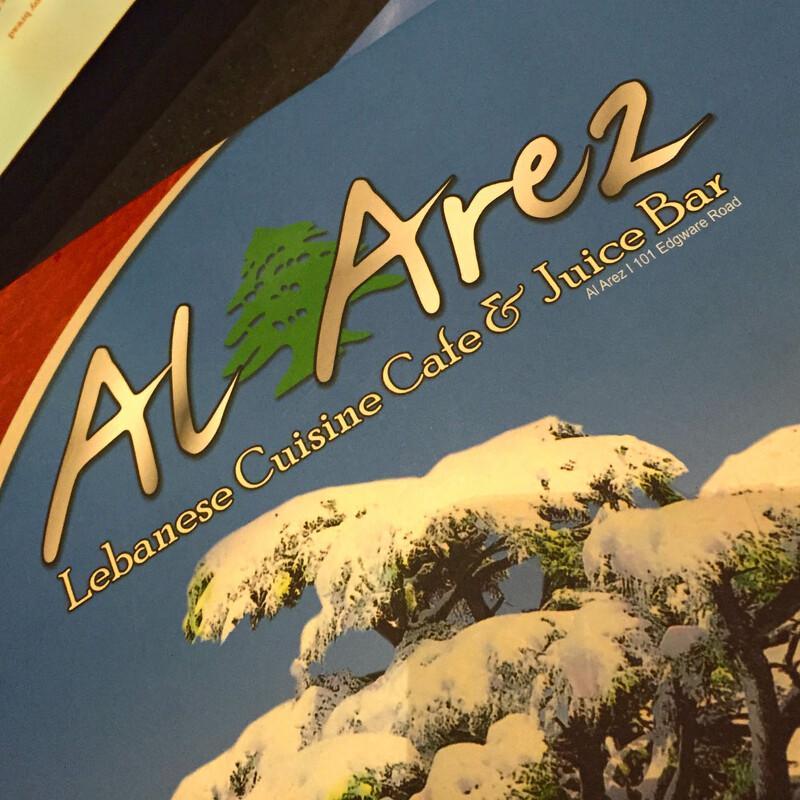 Al Arez are also known for their fresh juices. Zero additives, just pure fruit juice and some ice of course. 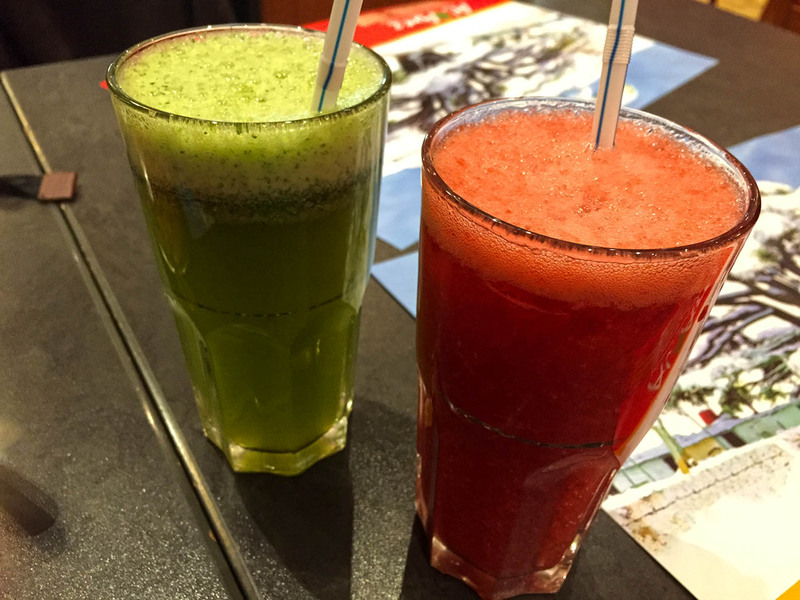 I love the fresh strawberry juicy but the Lebanese are known for their lime and mint juice which is really refreshing and zesty but far too strong for my delicate tongue. Like all Middle Eastern hospitality all bills are handed over with a plate of complimentary baklava. Fresh and crisp. 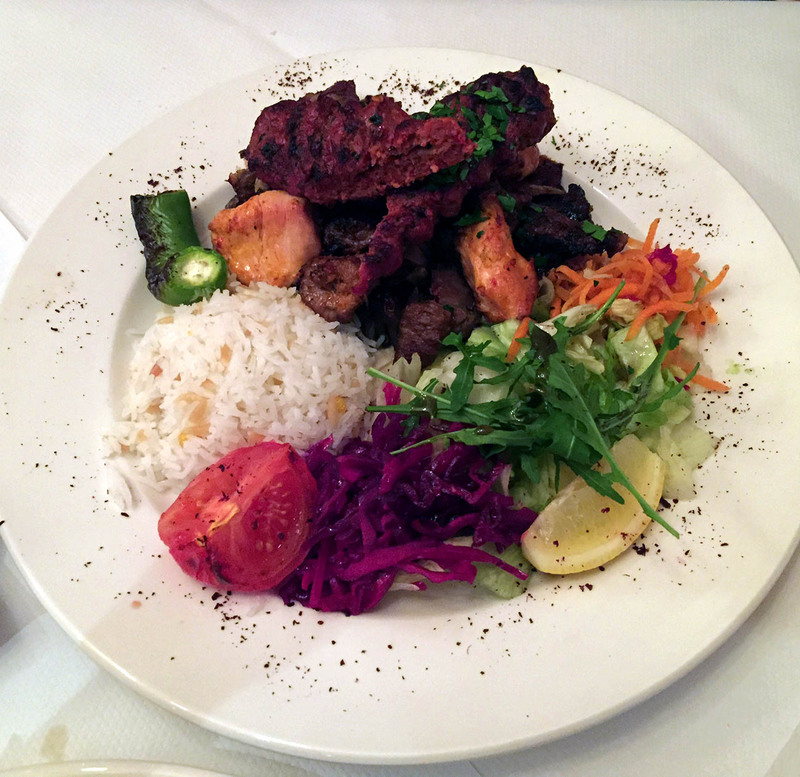 Perfect way to end your fabulous meal at Al Arez. 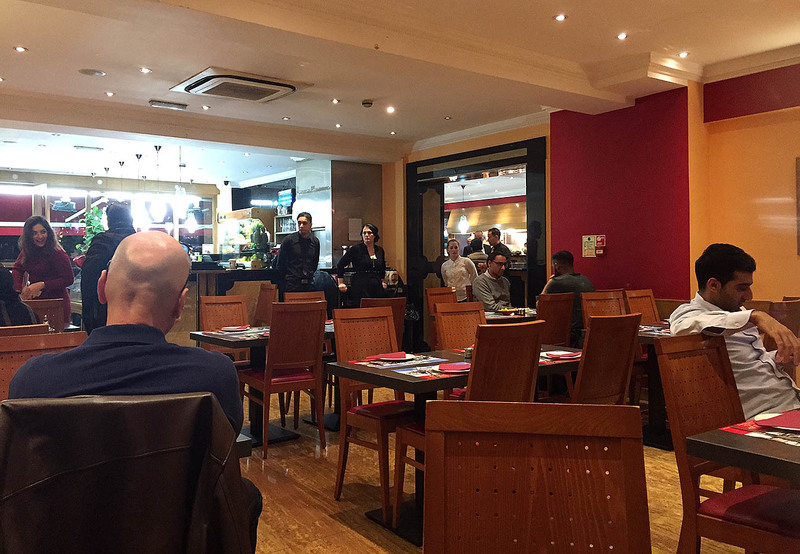 Al Arez are so popular they have about five different locations on the same street but we always prefer the original which is closer towards the Marble Arch end. 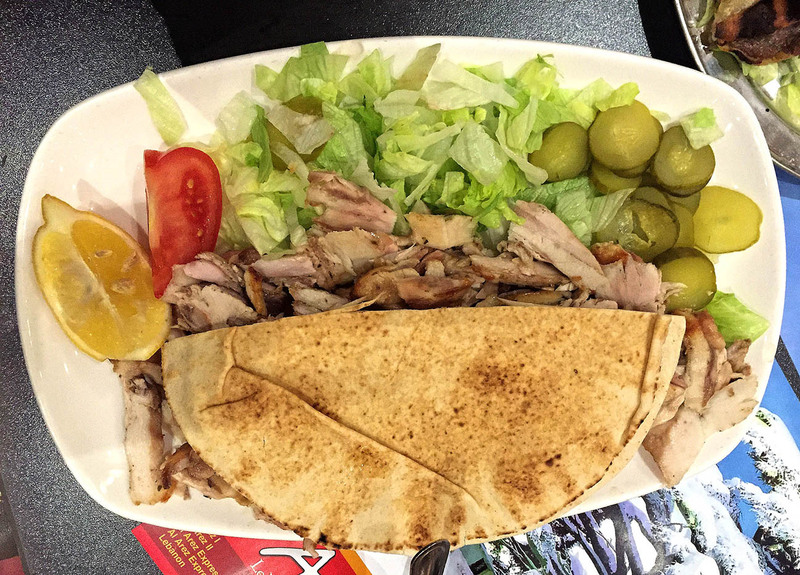 So when you are lost and hungry in the middle of the night, day, morning, head on down to friendly Edgware Rd and give trust worthy Al Arez a go. Isn’t Hampstead beautiful in the sunshine? We found ourselves wondering in the heath for hours, trying to soak in this lovely spring sun. Our walk certainly made us very hungry, wasting no time we popped into the first cafe we came across that was open for an early lunch. Fish Cafe does what it says on the door. 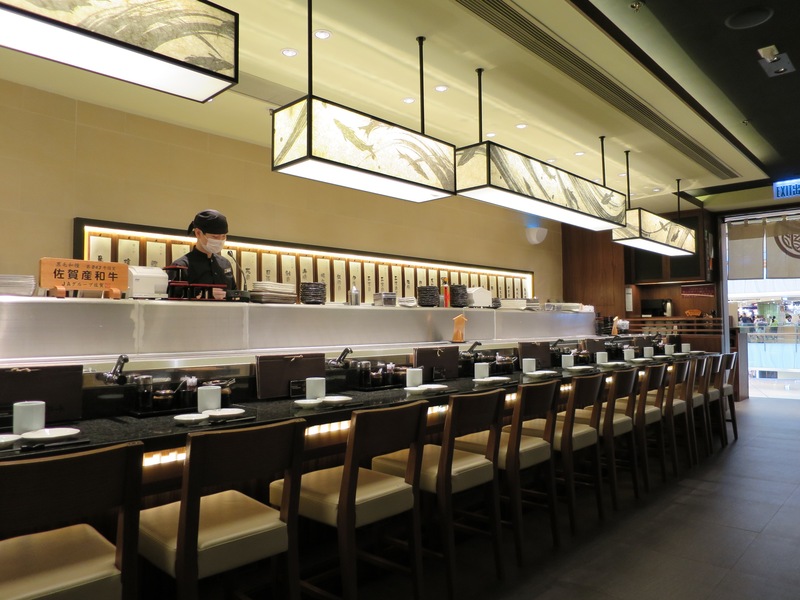 Their menu was a plethora of aquatic animals, all options available grilled or steamed. We kicked meal off with classic prawns in garlic butter. Couldn’t fault them, they were big and juicy. I loved fresh zingy salad that came with it. For me fish is something that is very hard to get wrong. The beauty of a well grilled piece is that it stays succulent and the accompanying dishes let the natural flavors of the fish shine. I like sea bream for it’s meatiness and the fact that there are not too many small bones, most coming apart from the meat when you pull the spine. 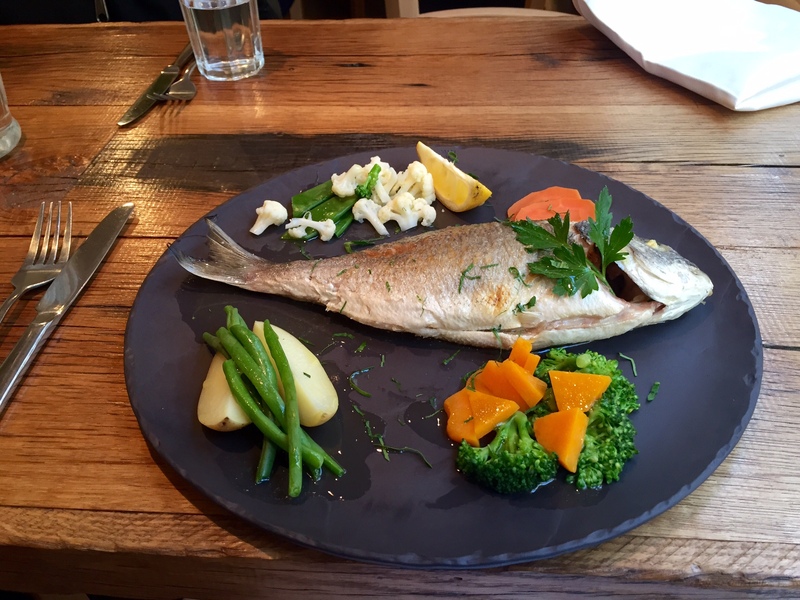 My sea bream was juicy with nice crispy skin, steamed veg was presented in a fun manner, whole dish was simple but kind of perfect. Fish pie was another story. It’s a risky item to order unless you are by the seaside where pies come straight out of the oven. 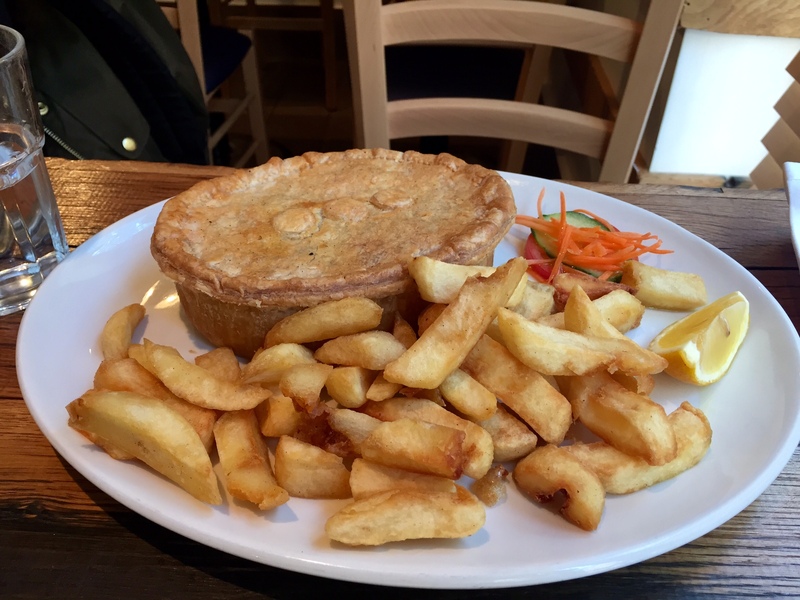 But our hungry tums always fall weak at the sight of a pie on the menu. This was a huge portion. Pastry was thick and the fish stuffing was a little bland, had to be fixed with a little salt and pepper. We were the only customers at the restaurant, at the end of our meal the manager of the restaurant came over for a chat. And what a chat it was! In less than twenty minutes we have felt we knew absolutely everything there is to know about Christian. Such a good laugh. He made us feel extremely welcome and for that reason we are very likely to come back. 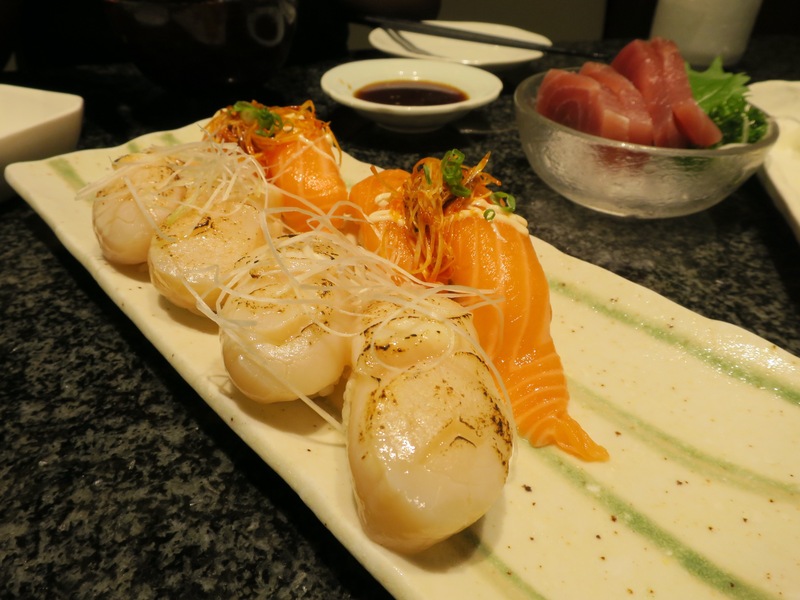 Fish Cafe is a no fuss restaurant with uber fast service, I would definitely recommend popping in for some great grilled fish. 71 Hampstead High Street. Hampstead. London NW3 1QP. Cocktail anyone? I love Las Iguanas for a number of reasons, the main reason is for their amazing 2 for 1 deal on cocktails. They have an incredible selection of delicious cocktails to suit everyone’s palette. On this particular visit I had a Long Island Ice Tea, Cosmo and a Raspberry Collins. Ha and it was only a Wednesday. They have an extensive Mexican inspired menu to suit everyone and well with my picky work colleagues it was a perfect way to keep everyone happy. 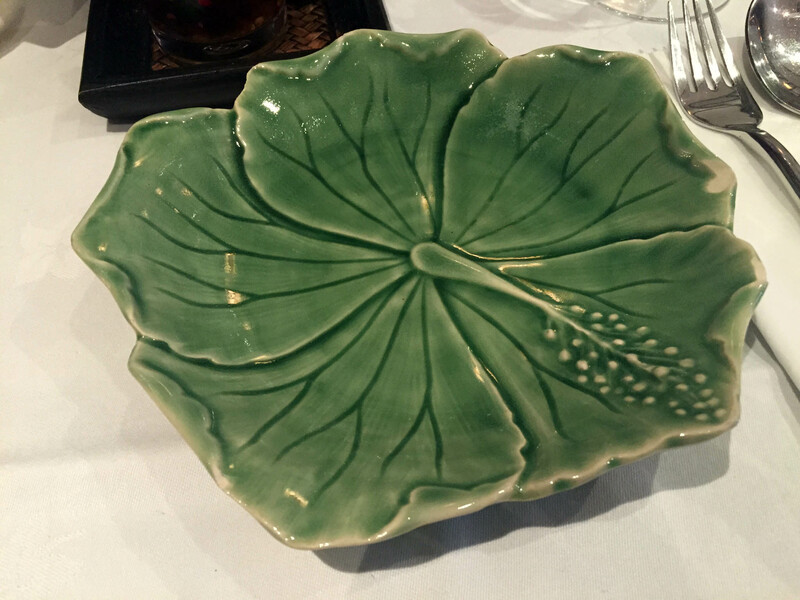 Lots of dishes have been had but I will only talk about a few. Some of the starters that I have on every visit are the: nachos, deep fried calamari and the fish taco. 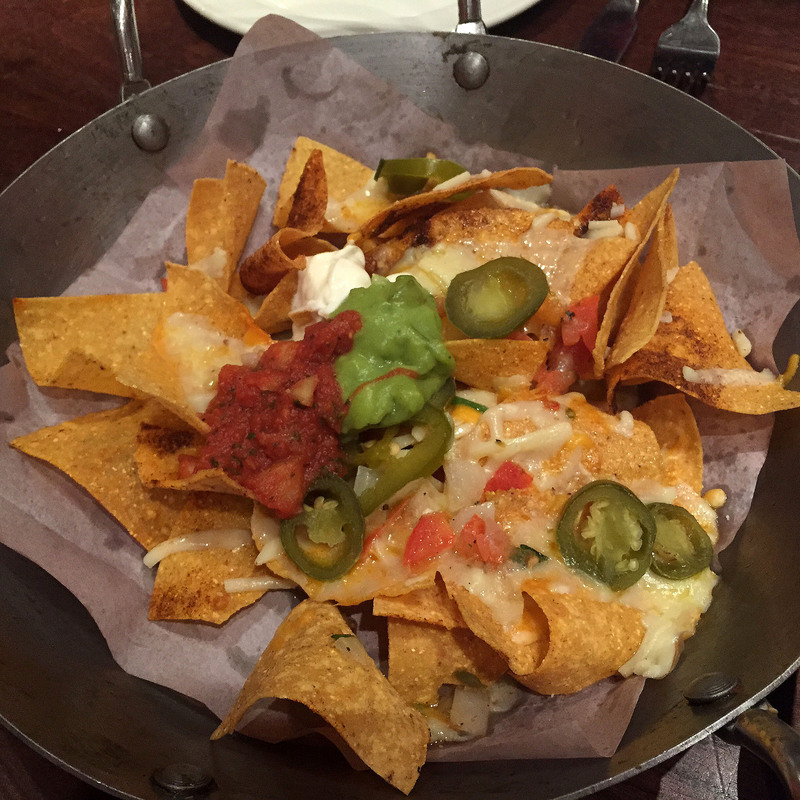 I’ll be honest the nachos are your bog standard nachos but you can not have Mexican food without a bit of nachos and salsa. 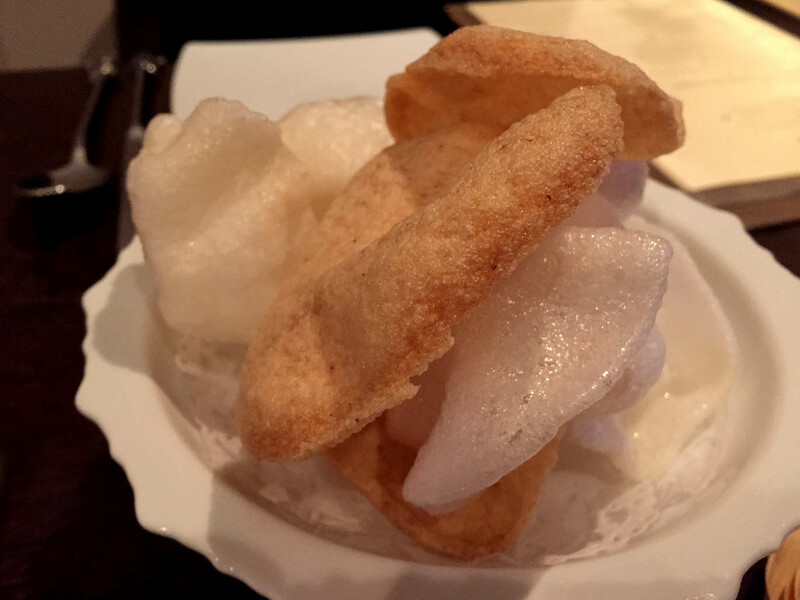 The calamari is crunchy and spicy on the outside and super soft on the inside. The calamari is served with a garlic aioli which even after I had finished the squid I kept dipping my fork into it and having a lick. The fish tacos are lovely. 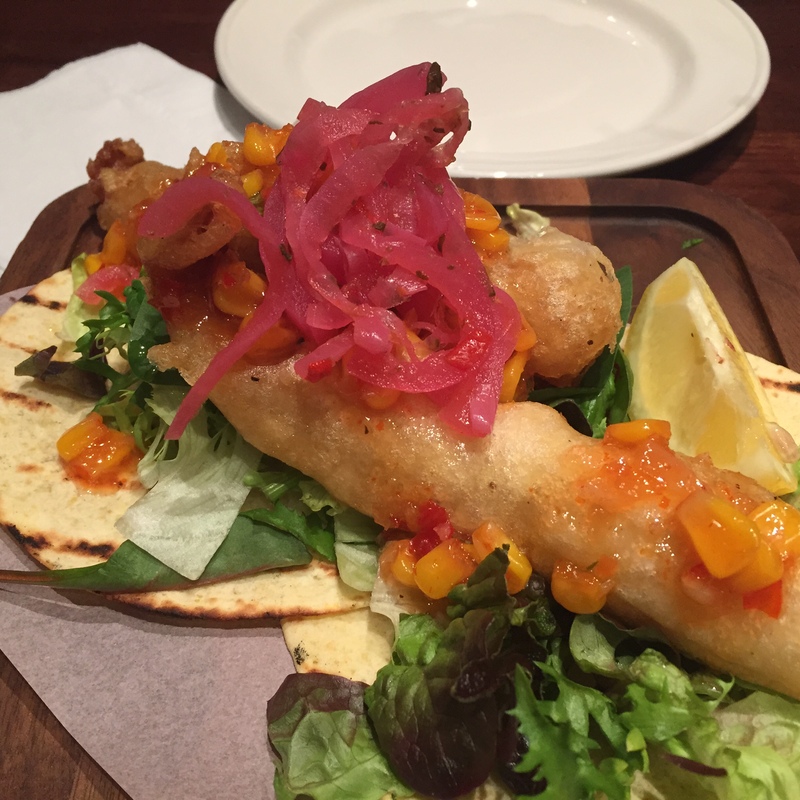 They are served with soft shell tacos and it is topped with the most incredible pickled onions. The cod is battered and sits in a bed of salad. I love how easy it is to pick up and roll the tacos. 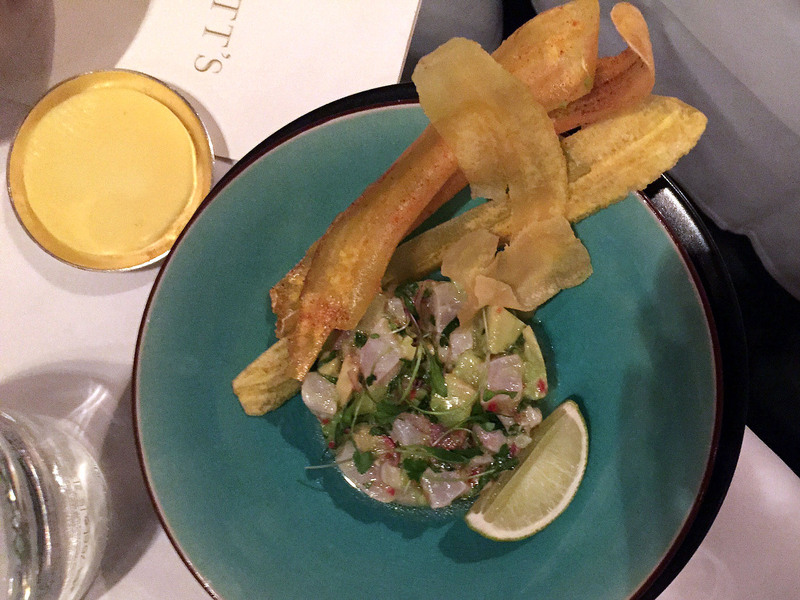 Out of all the starters the fish taco is by far my favourite with its range of tastes and textures. 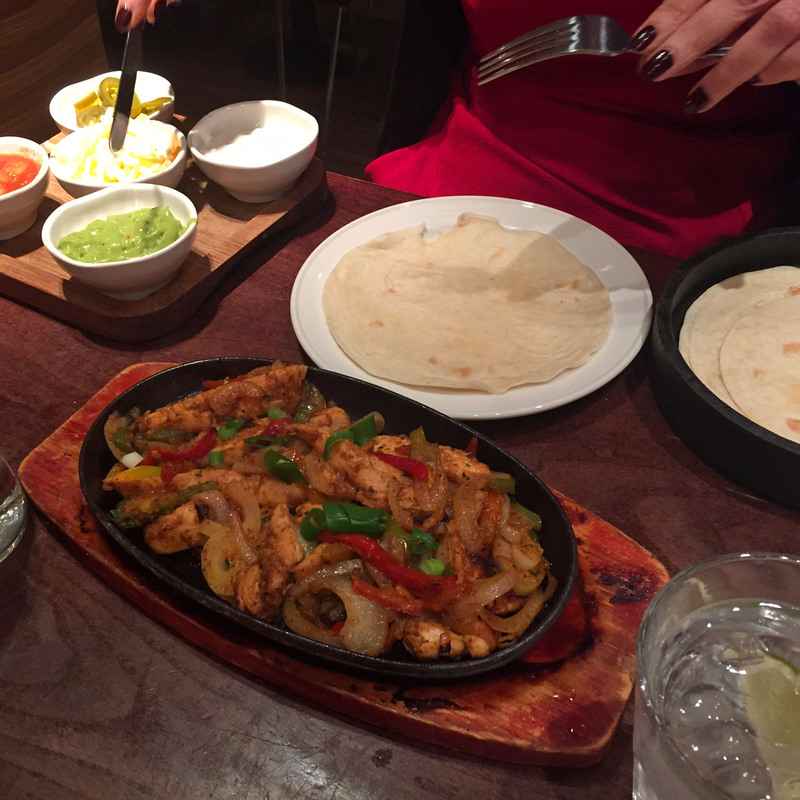 For the mains I can recommend the spicy chicken fajitas and the spicy chicken enchiladas. 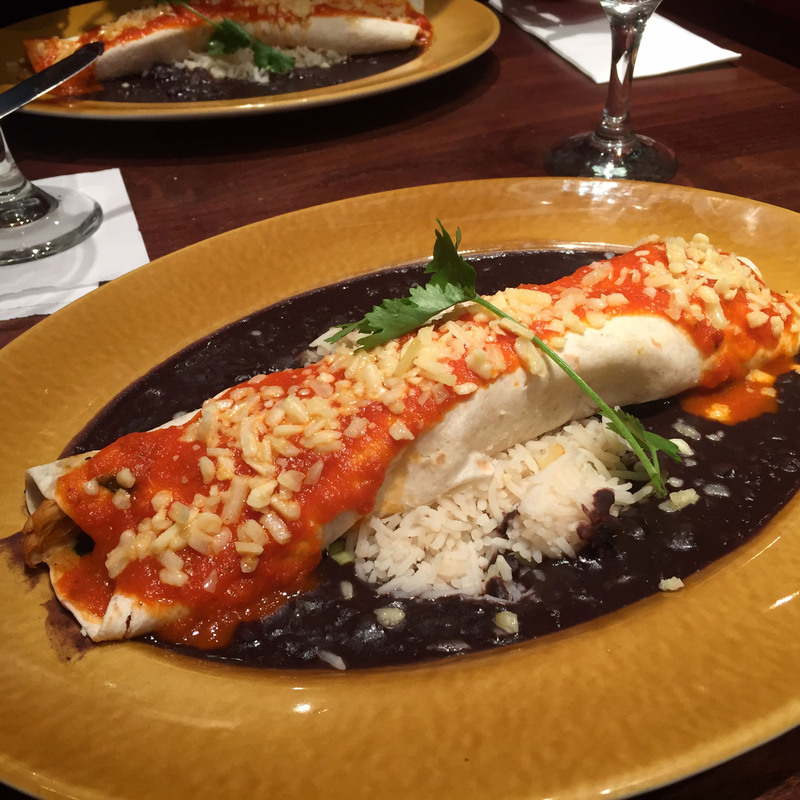 The portions at Las Iguanas are huge so you will never leave hungry. 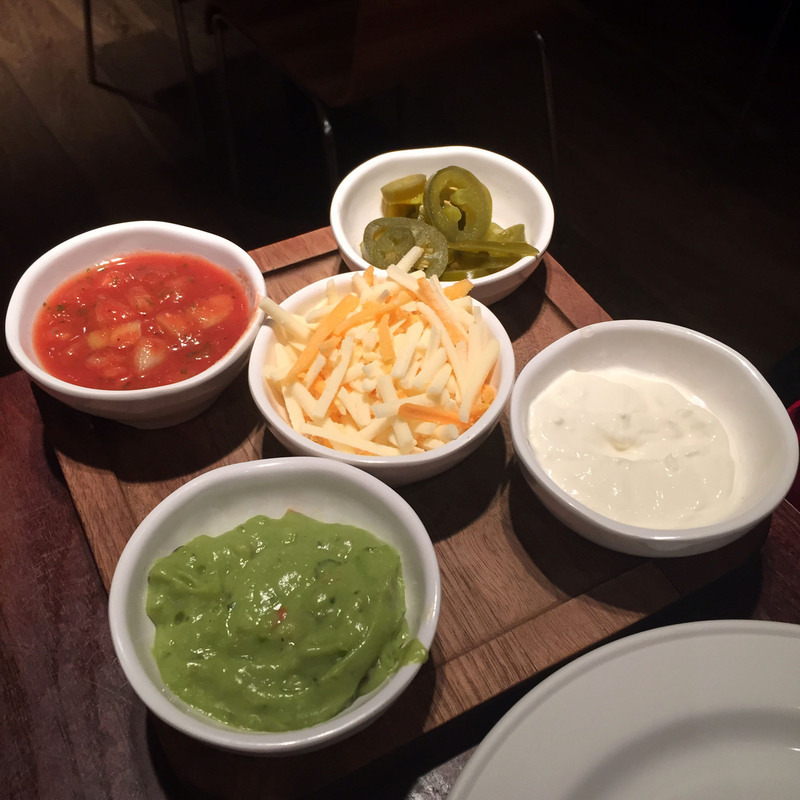 The fajitas are a whole lot of fun with the different dips and hands on eating as you have to wrap your own fajitas. A lot of finger licking. The spicy chicken enchiladas are my favourite. The wrap sits in a pool of re-fried beans. Now Las Iguanas have the best re-fried beans that I have had outside of Mexico so I truly appreciate the amount you get. 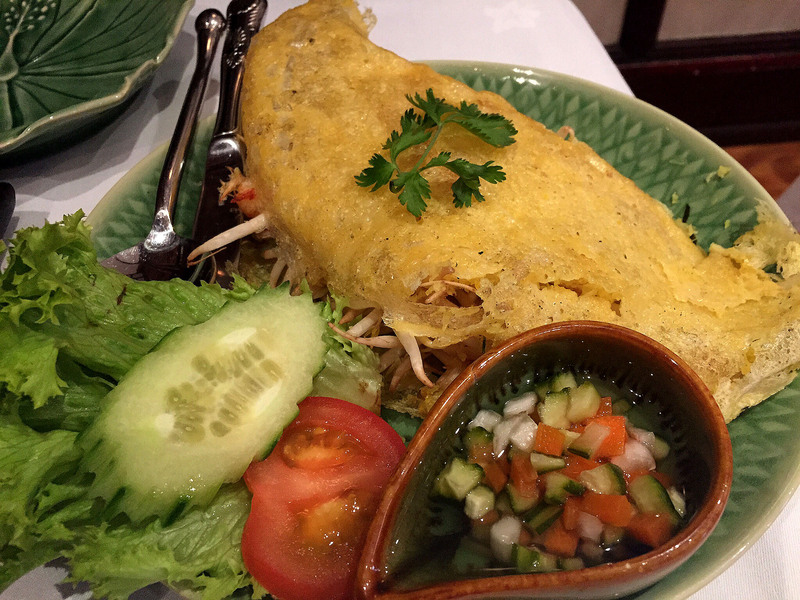 The wrap is filled with garlic rice and chicken and it’s packed with flavour. Now, top tip from me, ask for some sour cream to dip your wrap in, it’s amazing and the creaminess really works with the spicy flavours. 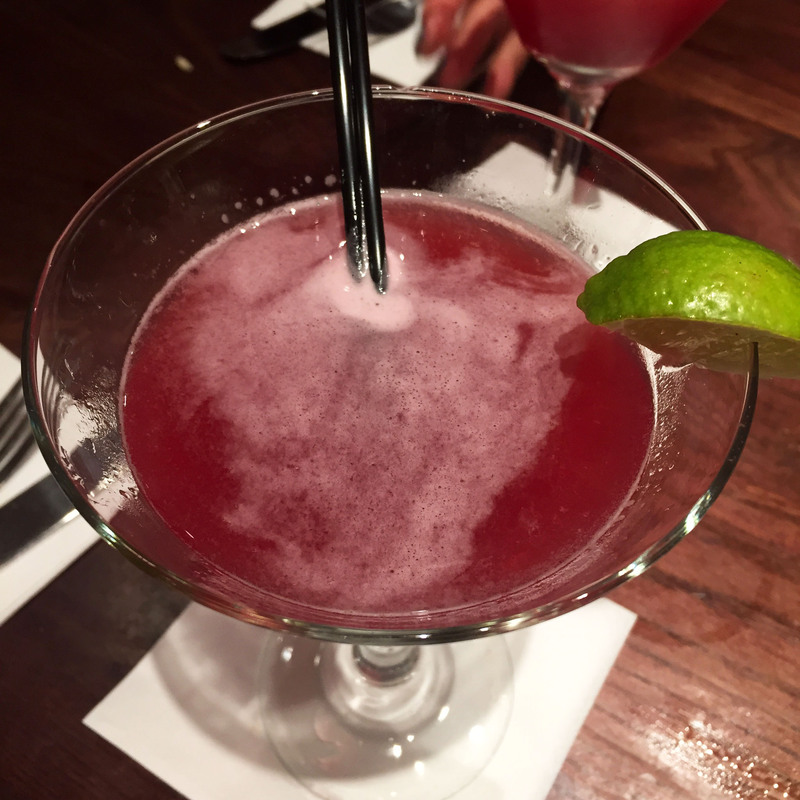 Las Iguanas is great place to dine especially with large crowds. The cocktails are delicious and the customer service is impeccable. The friendly staff make you stay that much longer with their friendly banter. We will definitely be returning for some fish tacos soon. 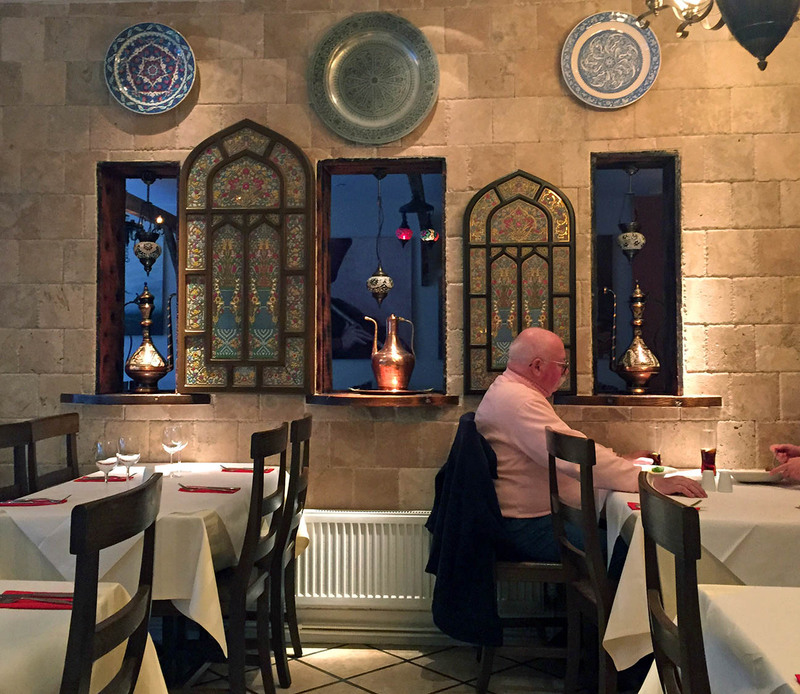 We love Turkish food and had always thought that it was rather difficult to find quality Turkish food outside of Green Lane until we found Sheesh Mangal in Worcester Park. Sheesh Mangal is an authentic Turkish eatery with all the trimmings of a coal fire, Turkish crockery displayed on the walls and beautiful ornaments in every corner. Upon arrival we were greeted with complimentary olives which were juicy and had a love spicy coating. 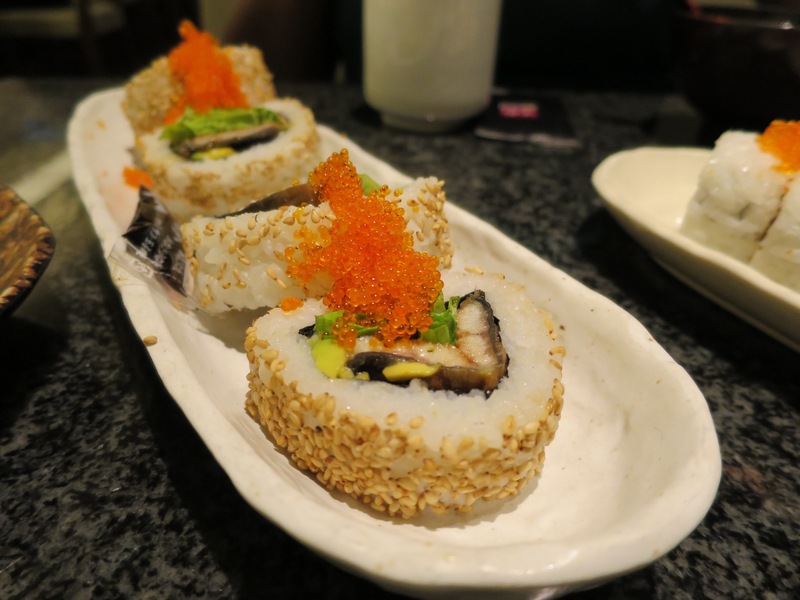 Something to nibble on as we shifted through the extensive menu. 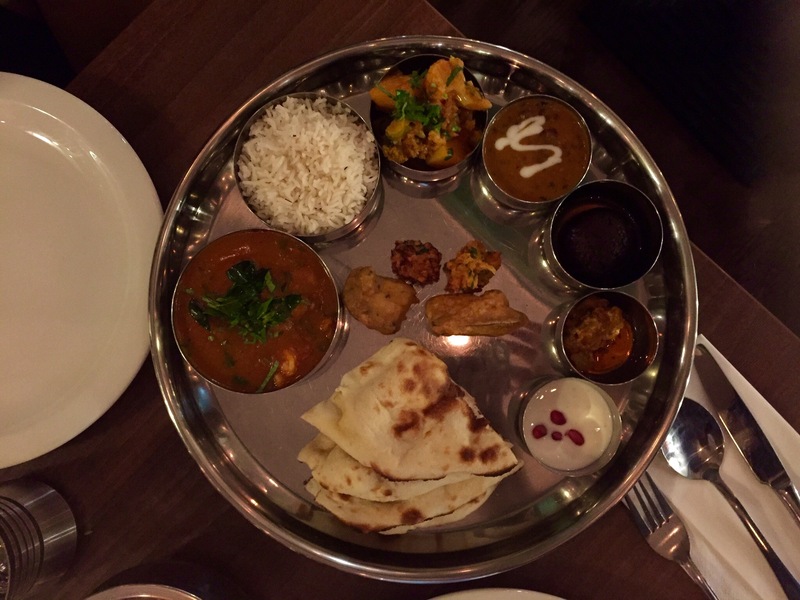 The mains are wonderfully arranged to make it easier to select dishes, all the dishes with yogurt in place, all the special curries in another, then the grilled dishes and so forth. This made it very easy for me to narrow down what I love and that’s dishes with yogurt if you didn’t know already. I selected the lamb beyti and my friend who loves meat selected the mixed kebab, to start with we ordered the hummus sautee. 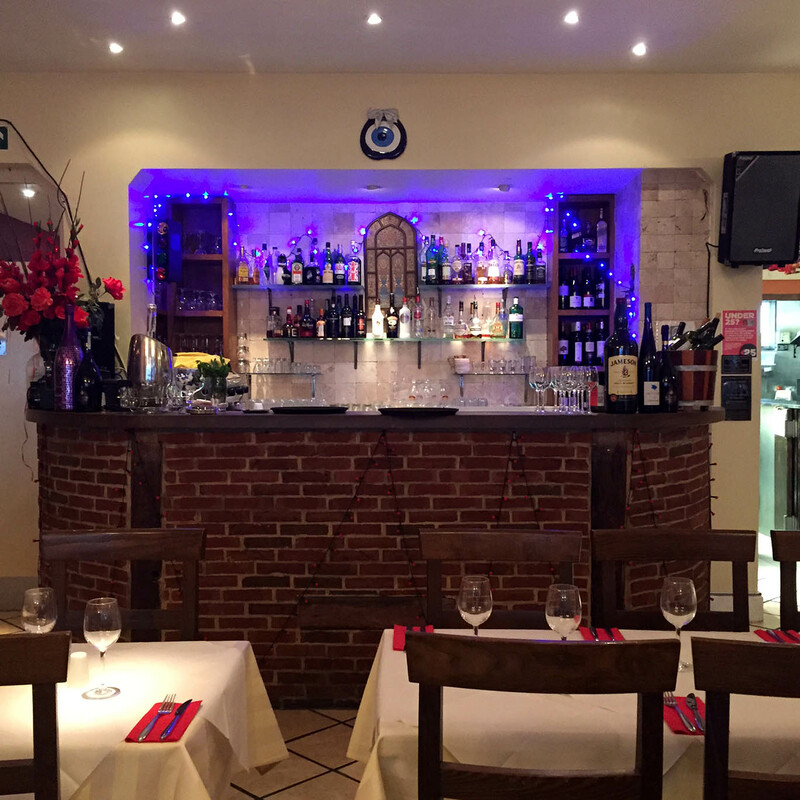 The menu has all the classic Turkish dishes from iskanders to pides so you will not be disappointed. 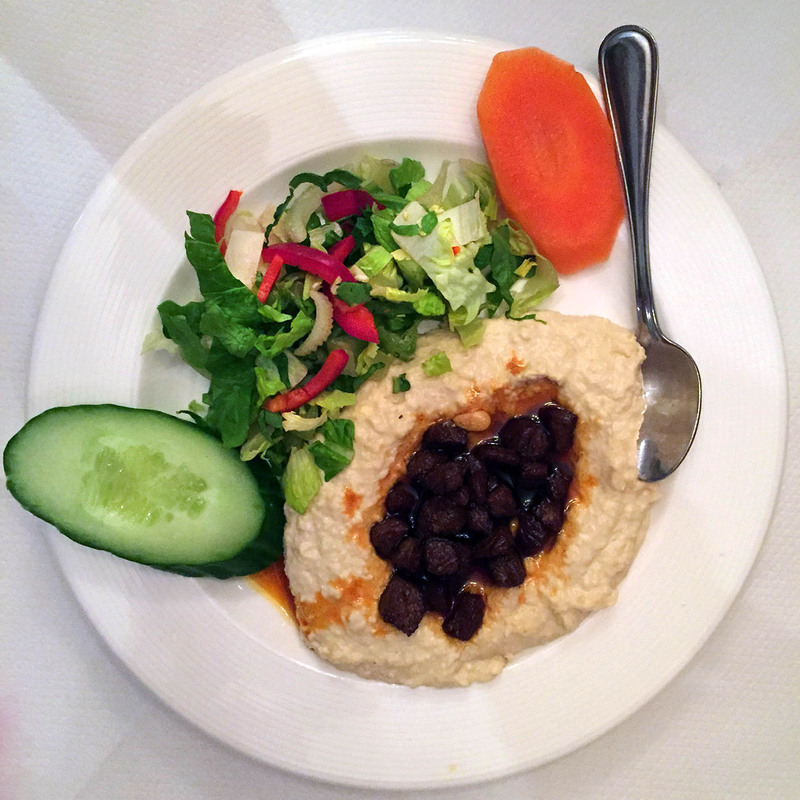 The hummus sautee is a warm mezze served with bread. The hummus is topped with a grilled cubes of meat which brings a new excitement to hummus very similar to the one served in Mandaloun but the hummus at Sheesh Mangal is freshly made. 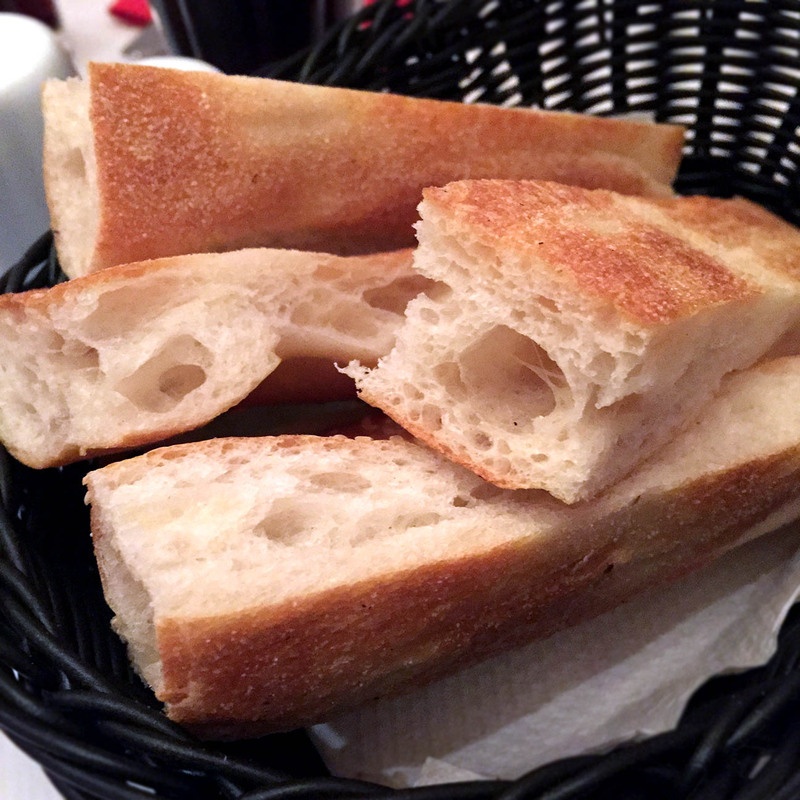 The dish is served with fresh lava bread and its one of those hands on eating situations where you rip the bread and scoop so don’t be shy. It’s odd to think how much difference the juicy meat to the hummus makes. 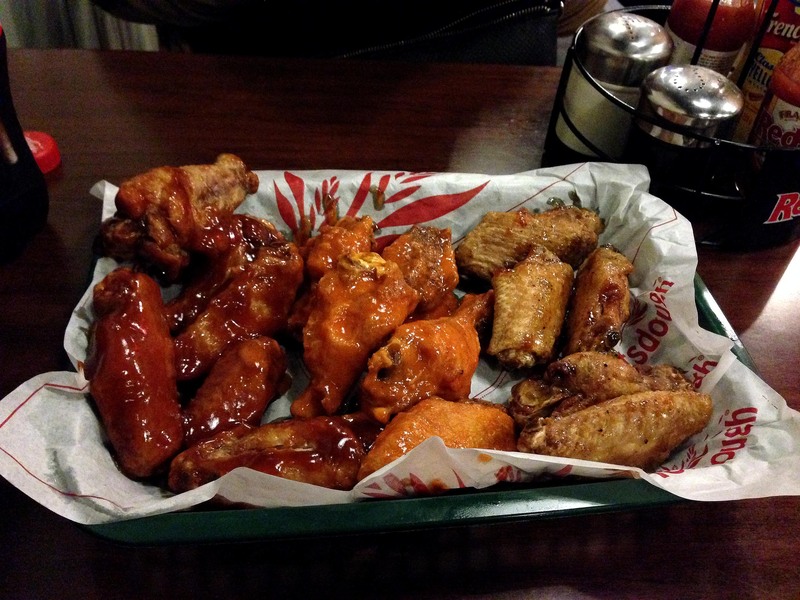 The portion size is enough for two and sharing is caring. However, if you are hungry I would reckon in a few different mezzes. 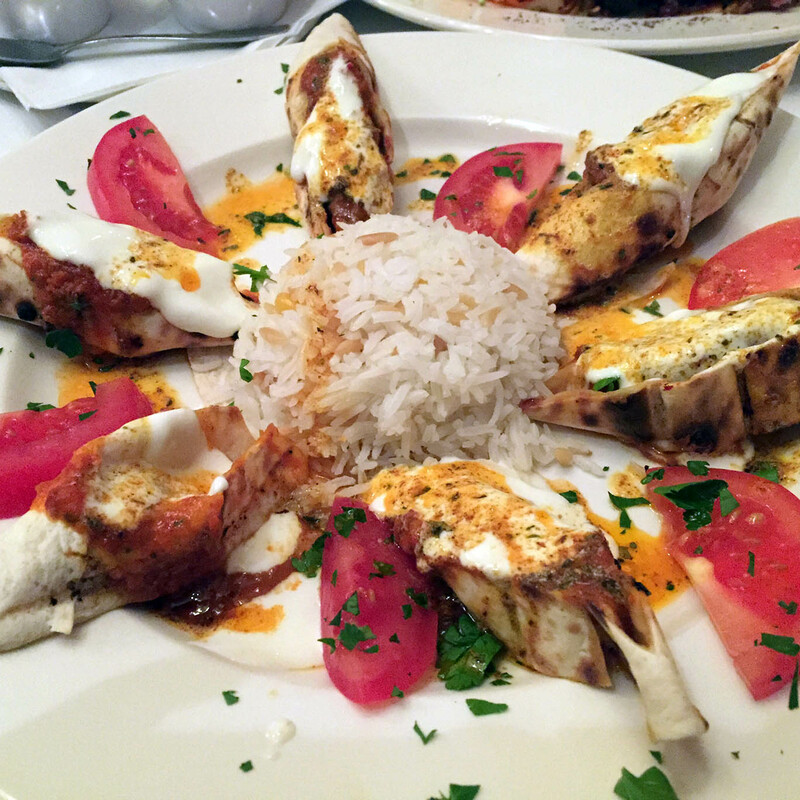 My beyti lamb is served similar to a yogurt Adana in other Turkish restaurants. Each piece of meat is wrapped in a tortilla wrap and topped with yogurt. 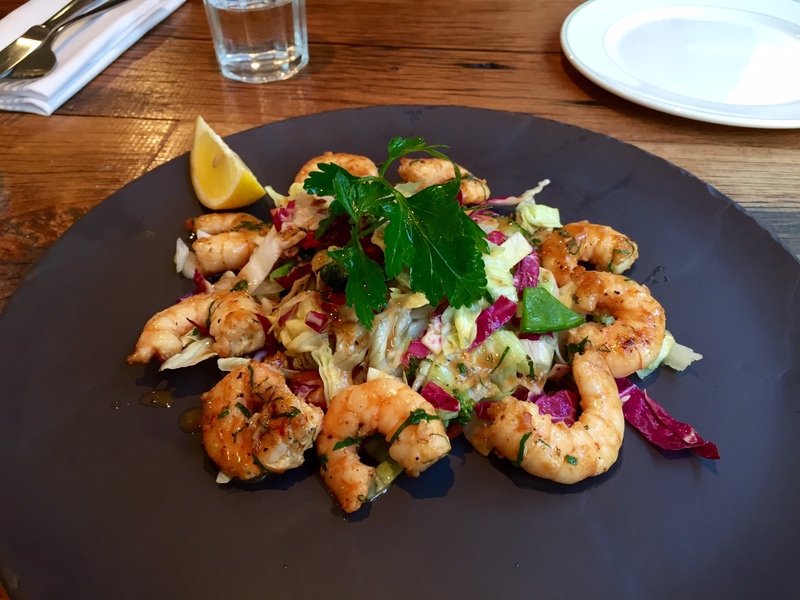 The dish is also served with the gorgeous Turkish vermicelli rice and that amazing rocket and pickled red cabbage salad with the sumac and lemon dressing. The dish is delicious. The meat is spicy and has a tad coating of tomato which seeps through the wrap just the way I like it. There is a generous helping of yogurt which just works so well with the meat. 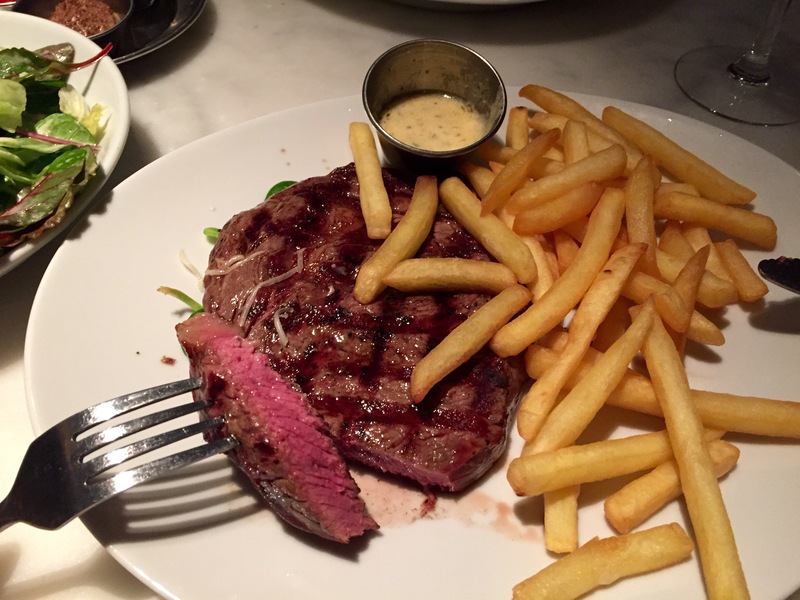 My friend’s dish may have only cost £15 but boy was it value for money. I half wondered how he would eat it all but he found a way and well I did help out a bit. On his platter he got a lamb and chicken shish, lamb doner, Kofta and beyti, all serve with salad and rice. The meat was cooked to perfection. The staff are friendly and walk around engaging in conversation. 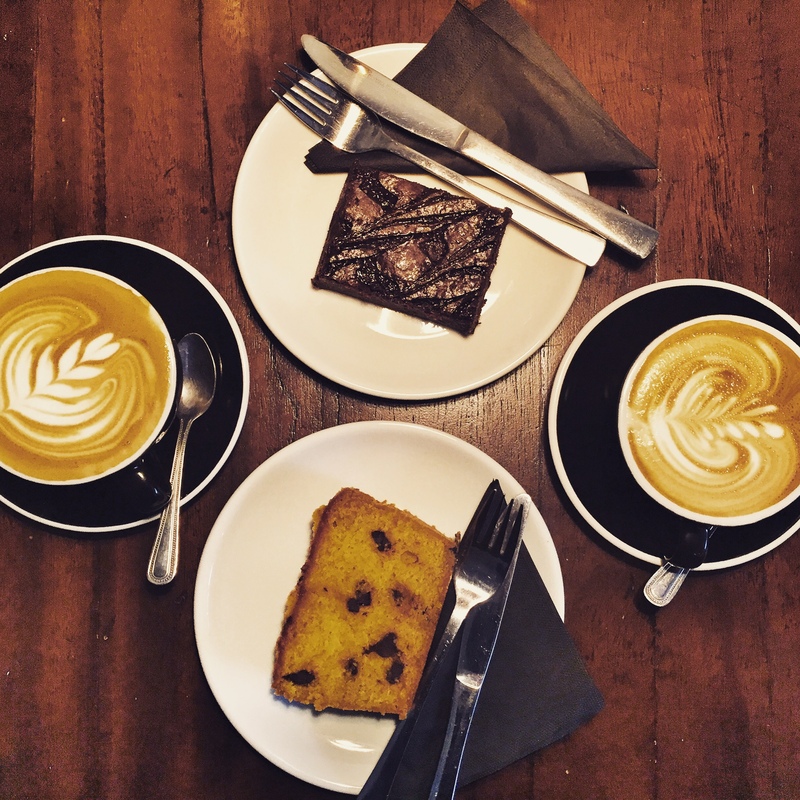 Customers seem to be regulars and everyone knows each other which is a good sign as they seem to love and trust the place. All of it gives it such a good vibe so you can’t help but sit and enjoy your time here. 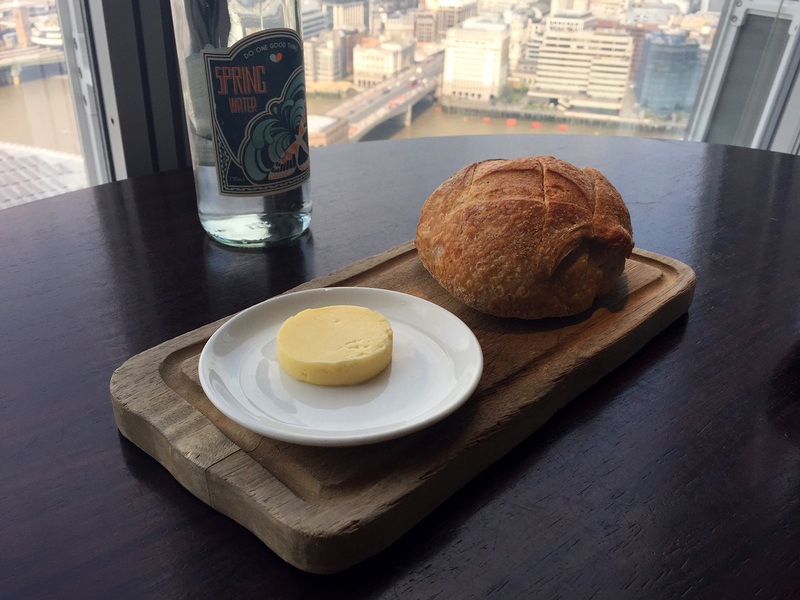 The staff are very tentative so you will never sit with an empty glass or plate for long. 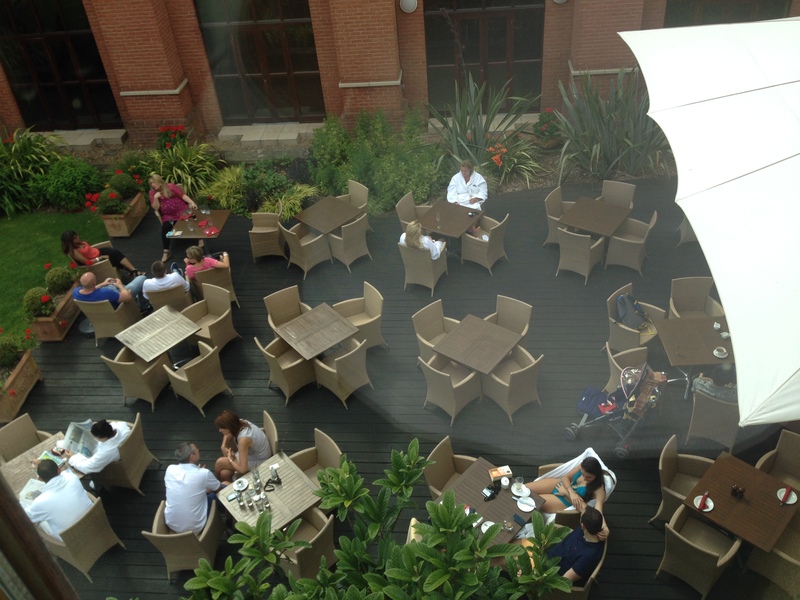 Parking is amazing when you come to Sheesh Mangal and free. Outside there are a number of parking bays for customers and all the side streets are free to park on too. 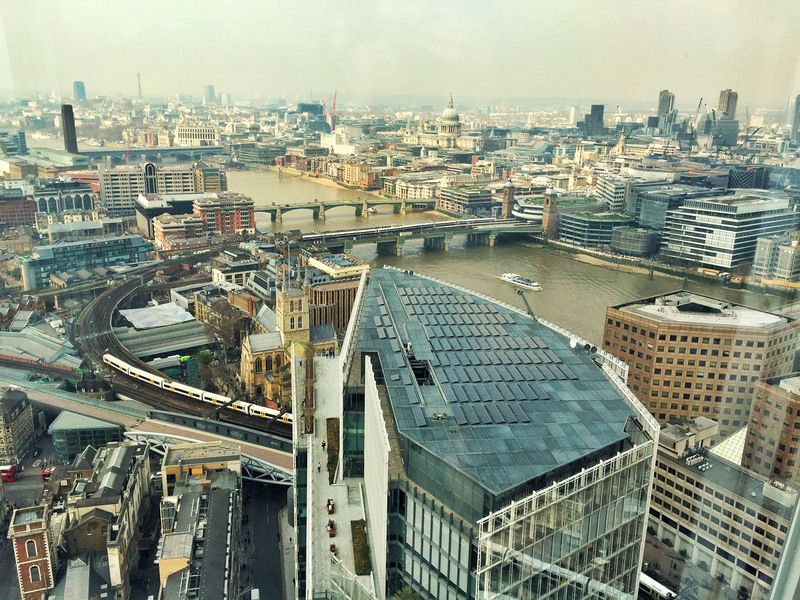 A Londoners dream! I can not believe this place has always been 10 mins away from my home and yet I have not tried it. I will definitely be back here soon to eat my way through the rest of the menu.